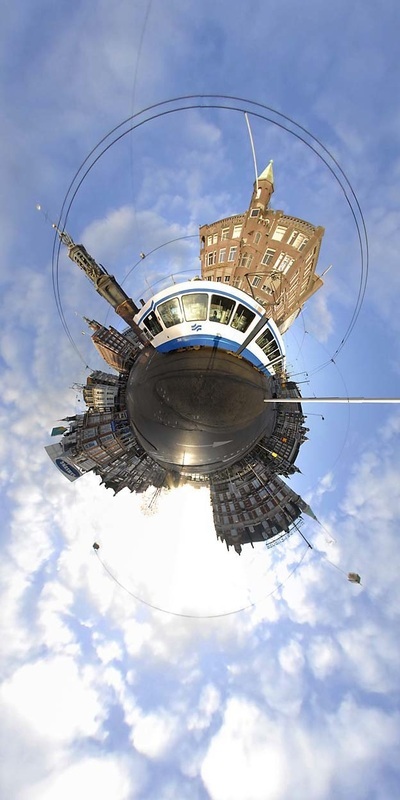 You can navigate to subpages to have the Hyperbolics ordered in the locations Amsterdam, Rotterdam, Utrecht, The Hague, Paris, Barcelona, Scotland, assignment in Enschede, Singapore, Dubai, Sydney and Elsewhere. 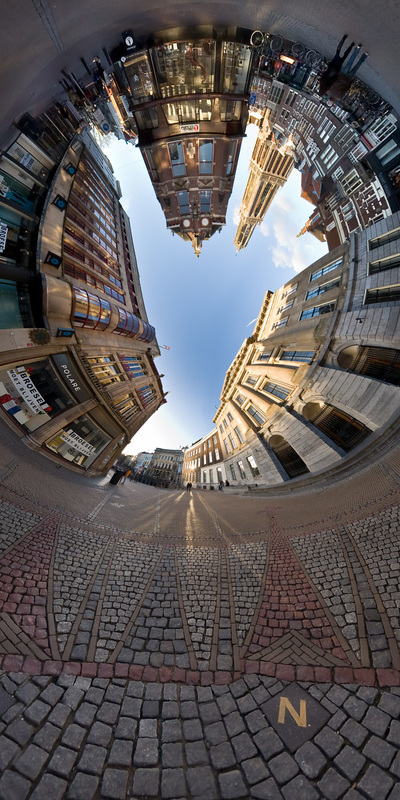 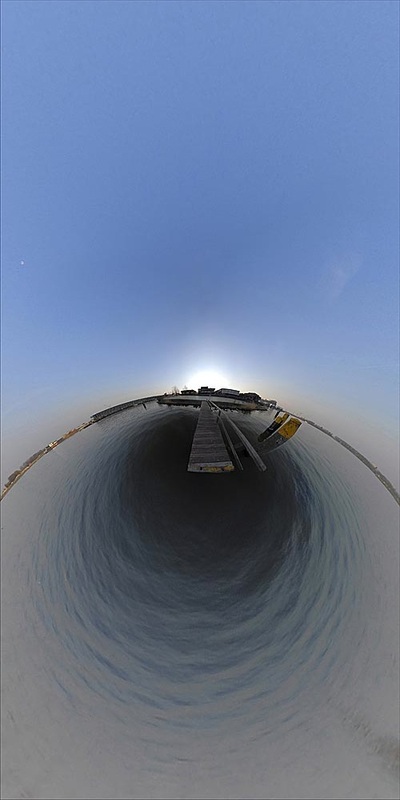 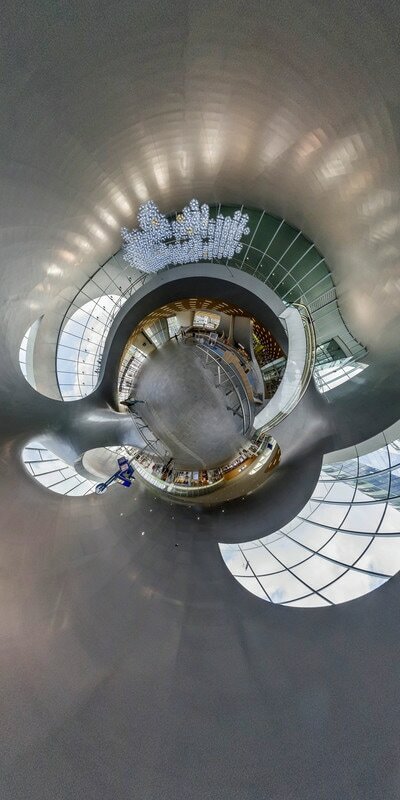 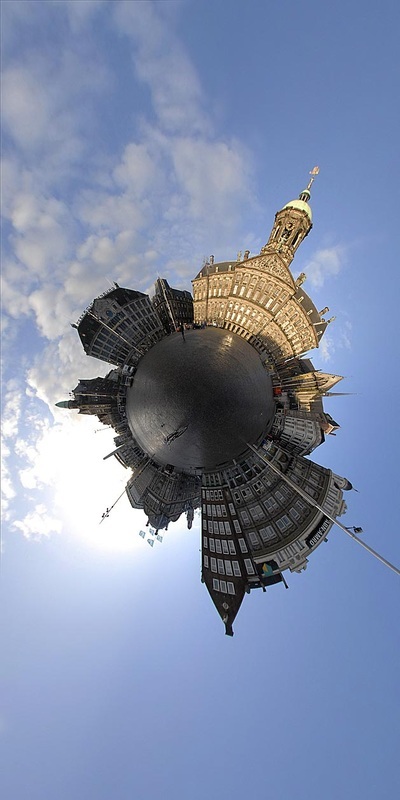 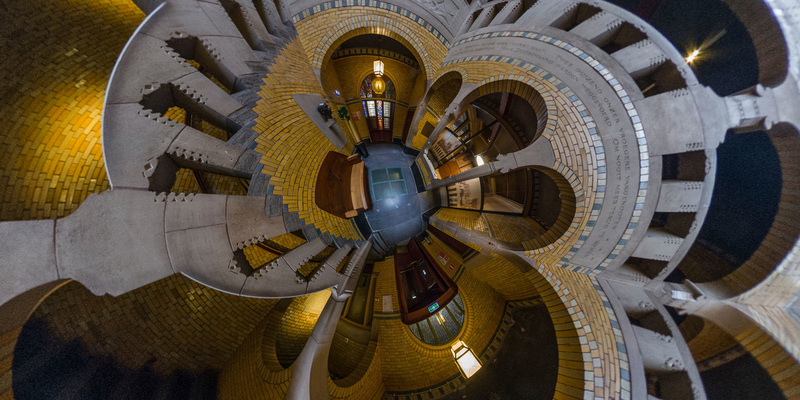 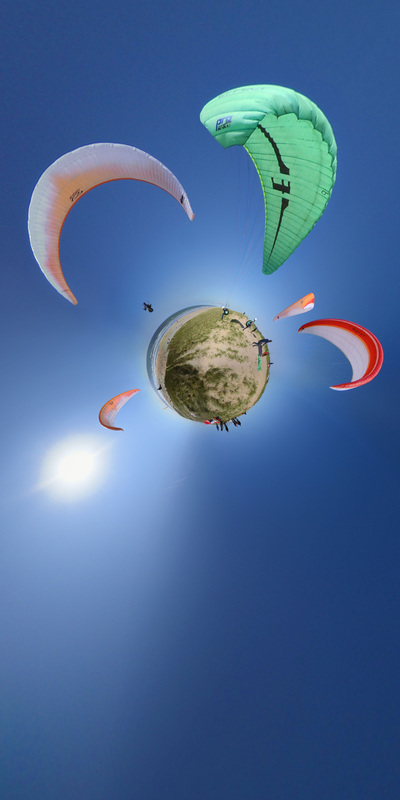 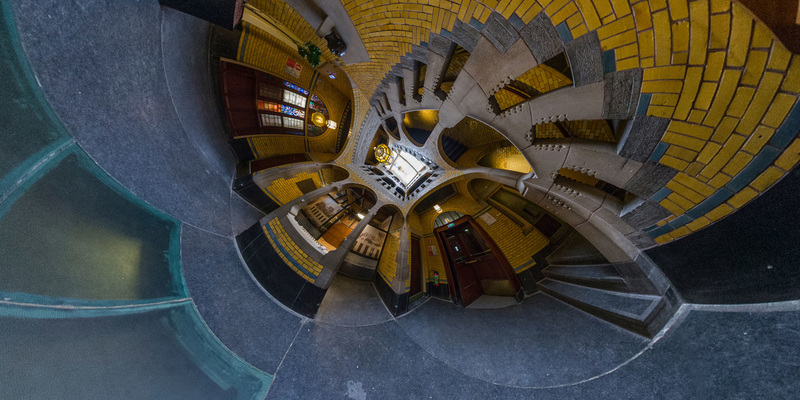 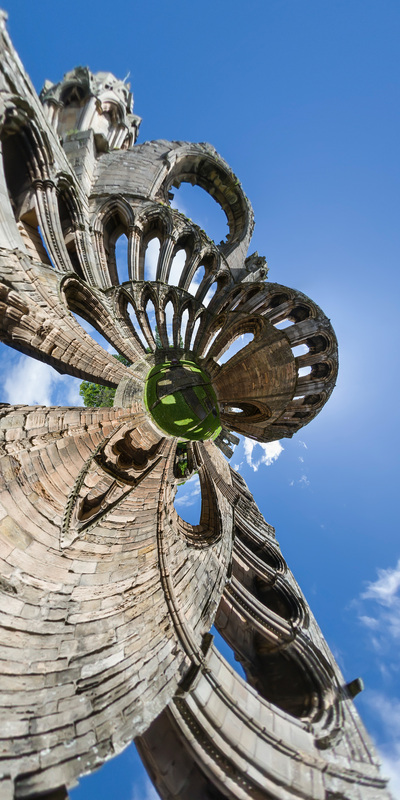 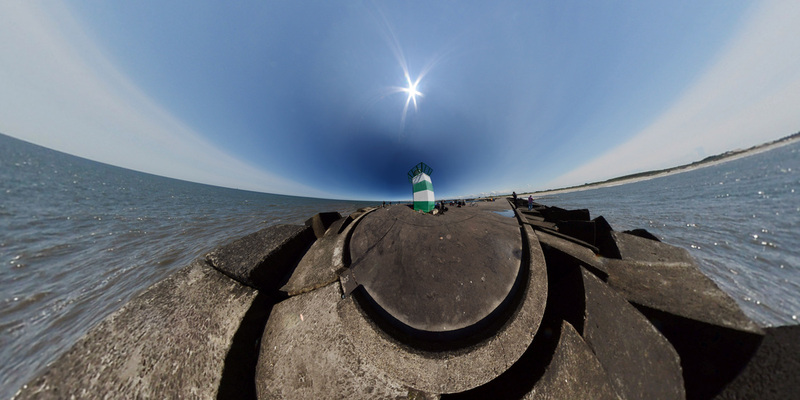 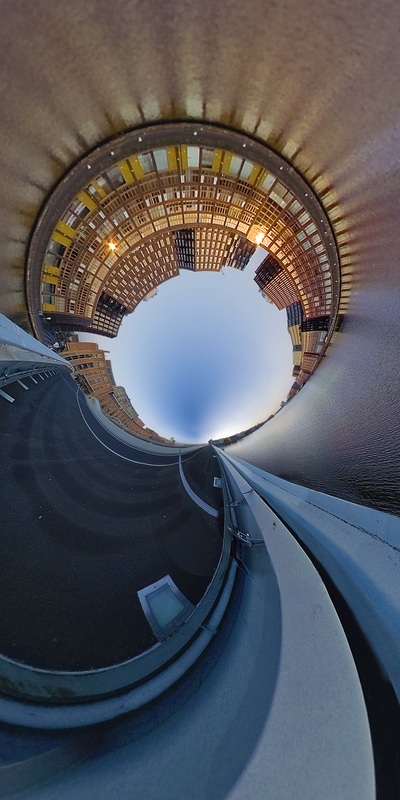 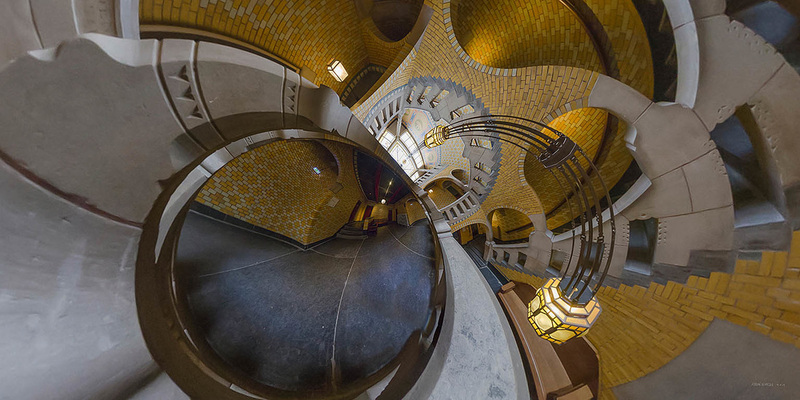 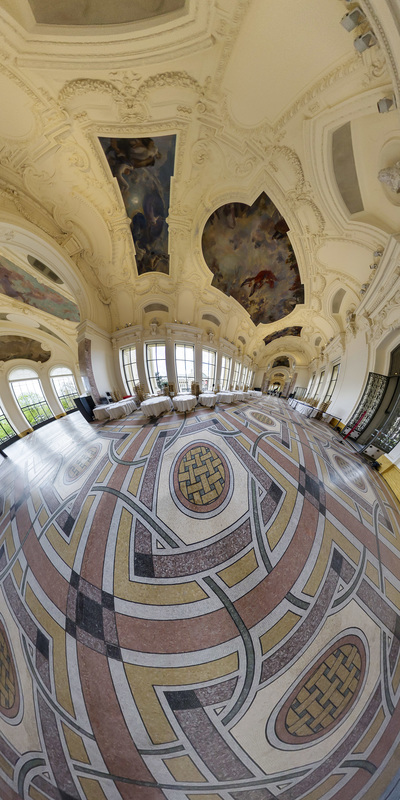 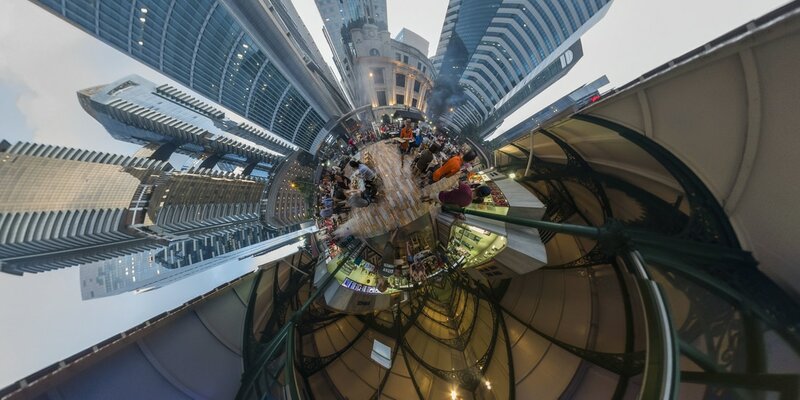 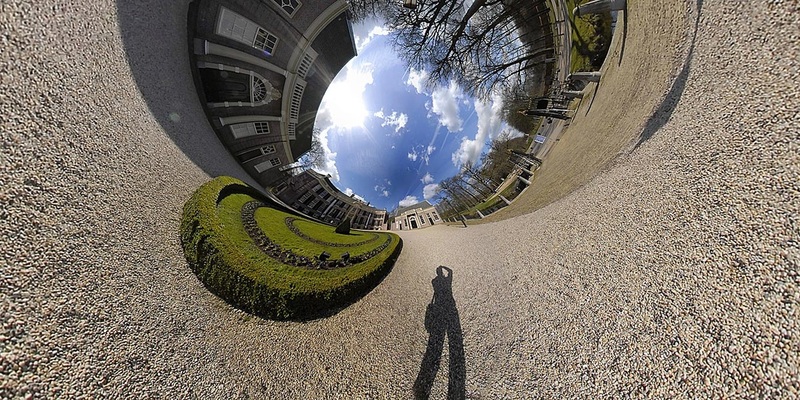 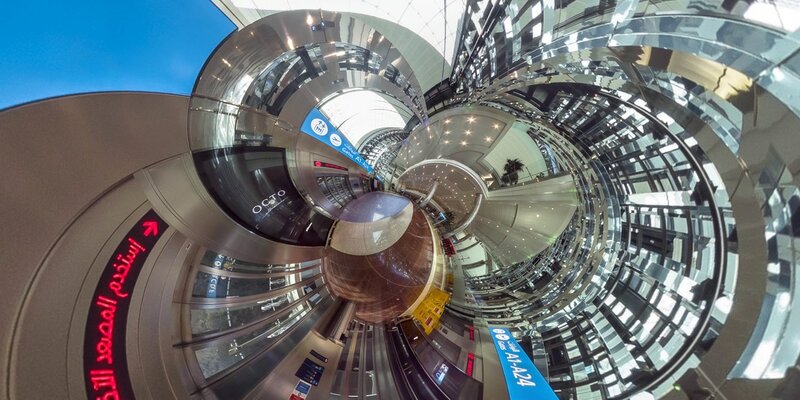 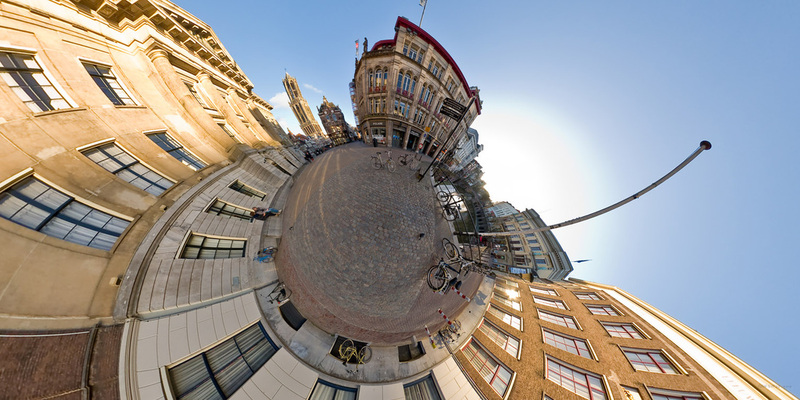 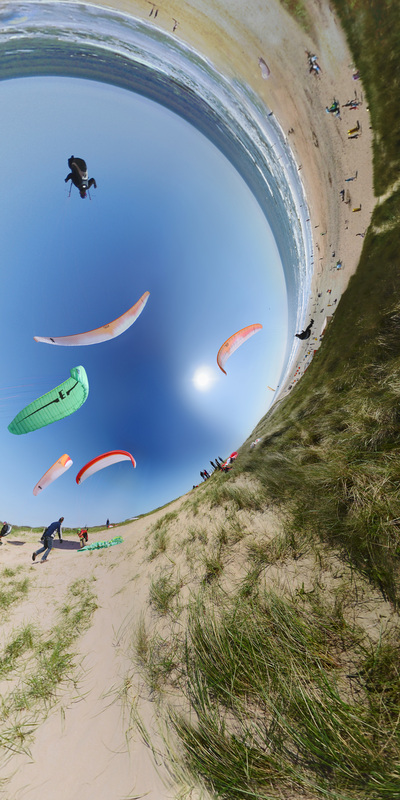 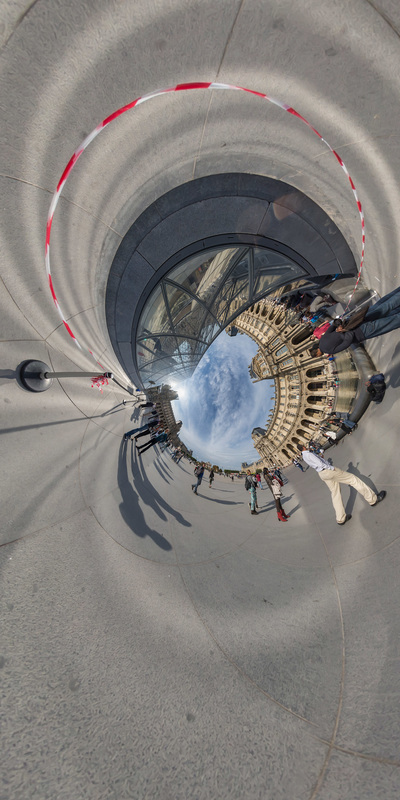 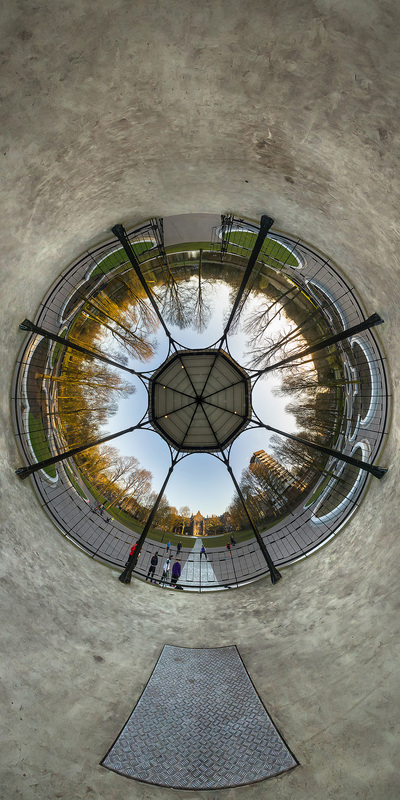 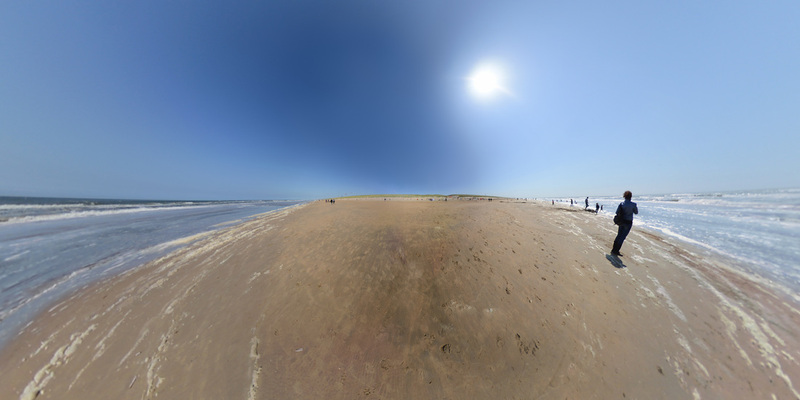 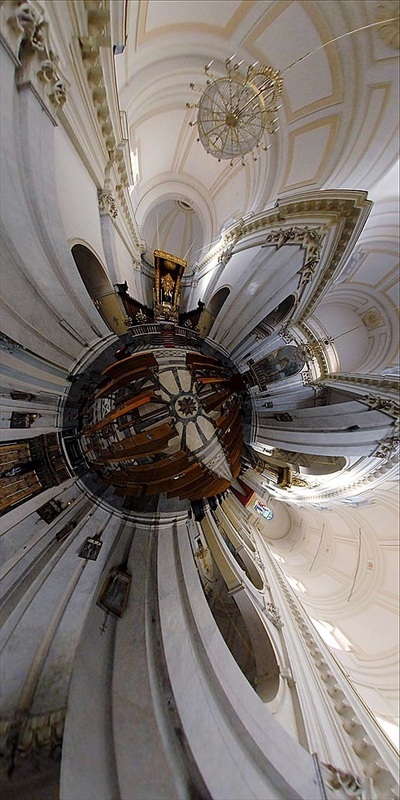 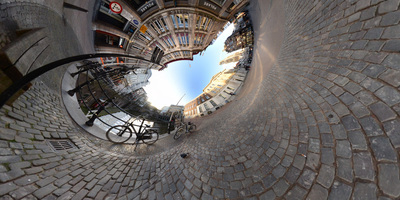 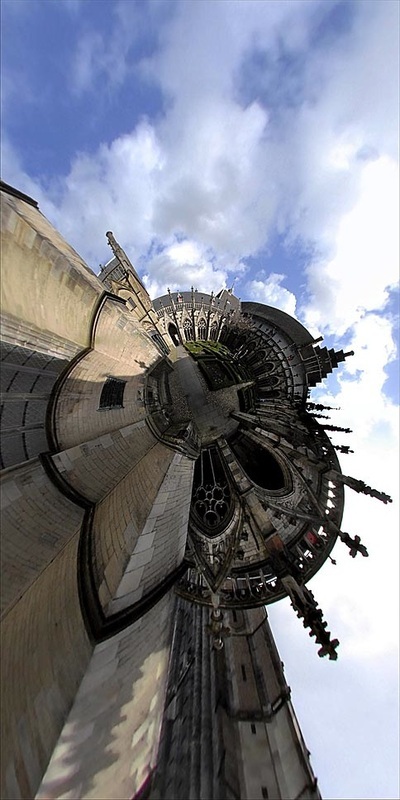 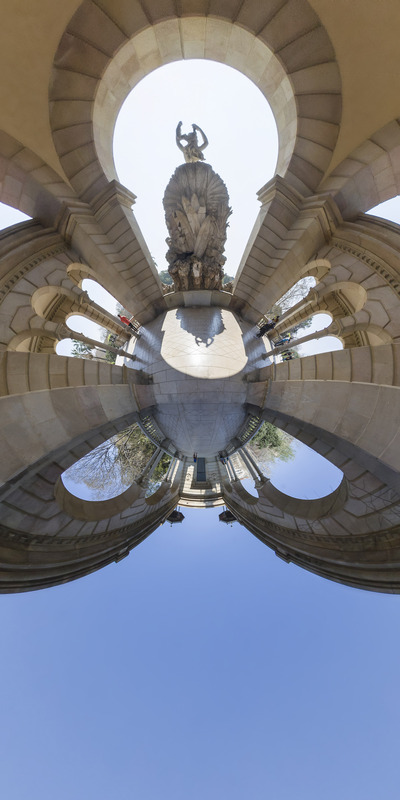 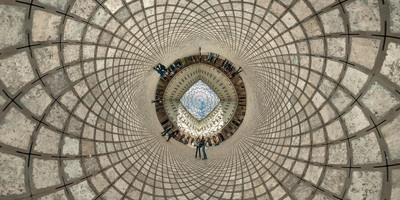 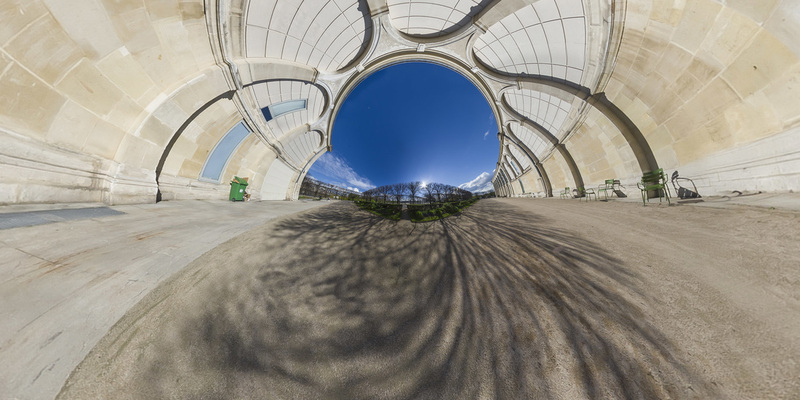 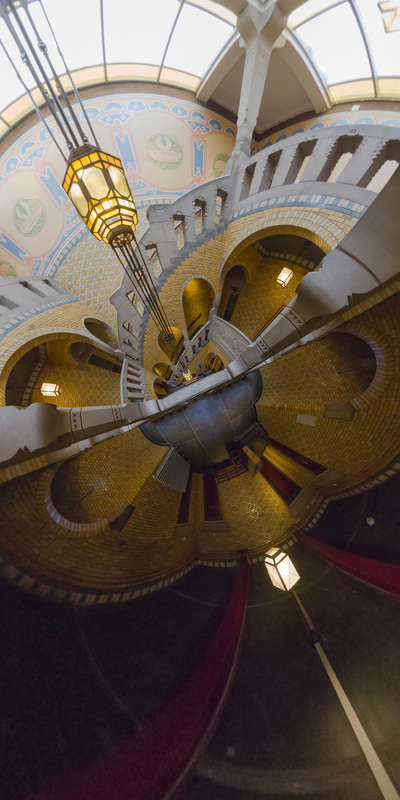 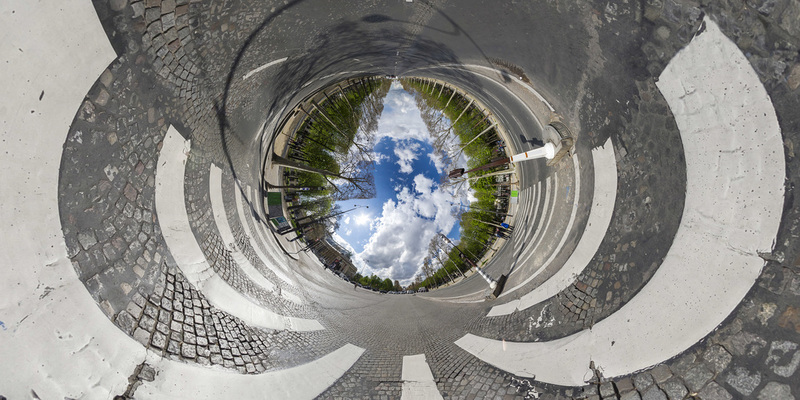 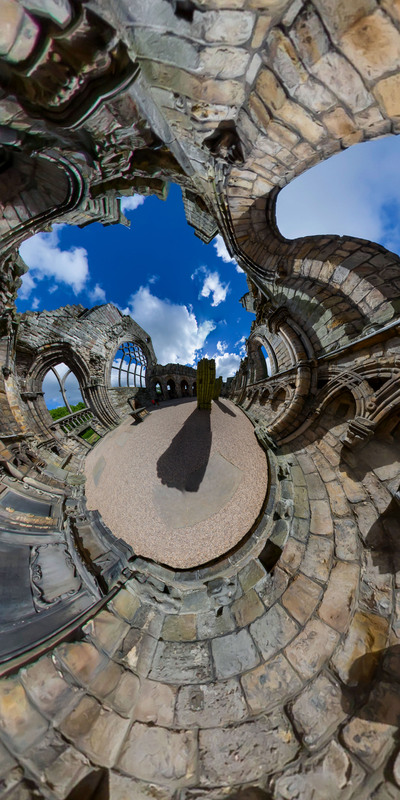 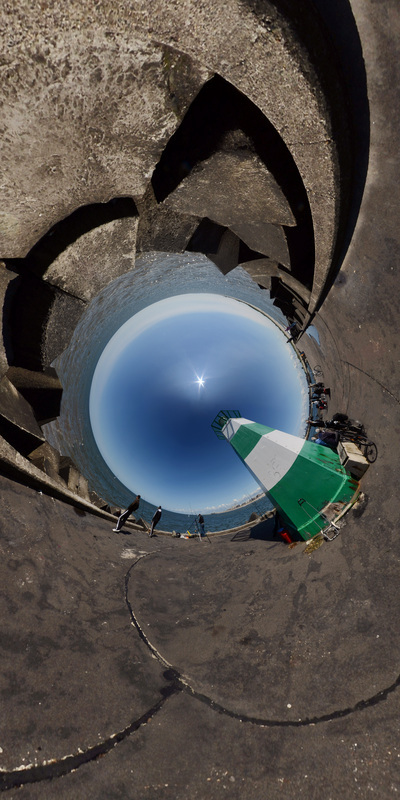 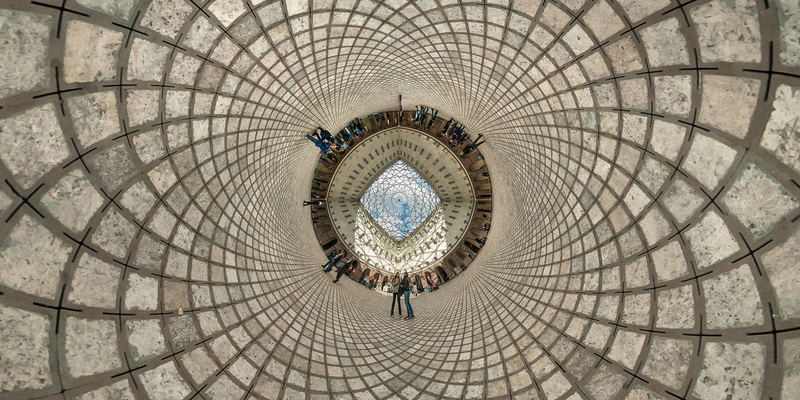 A hyperbolic image is a projection method, in which a 360° panorama is mapped onto a flat surface. 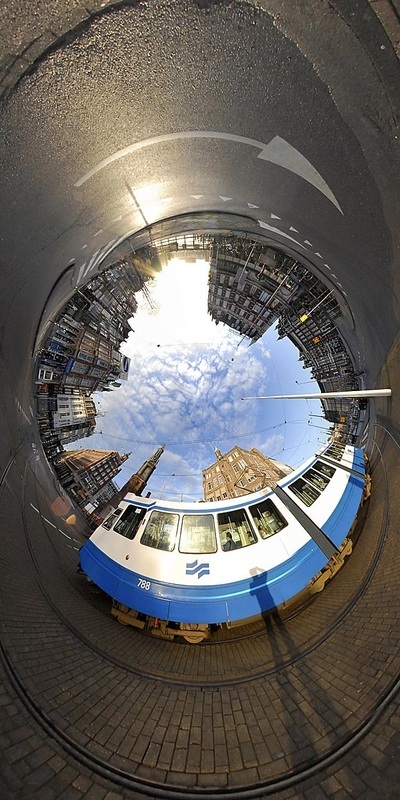 This can result either in a convex or a concave world. 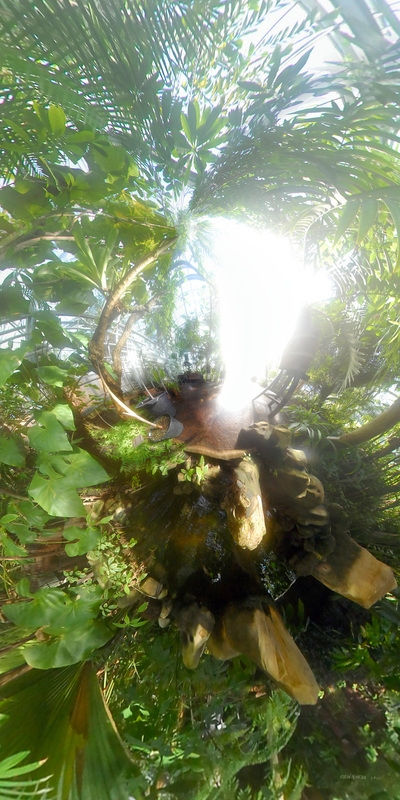 It simulates the visual perception of an insect with its bulging compound eyes, that provide almost 360° vision, limited only by the blind spot caused by the insect's own body. 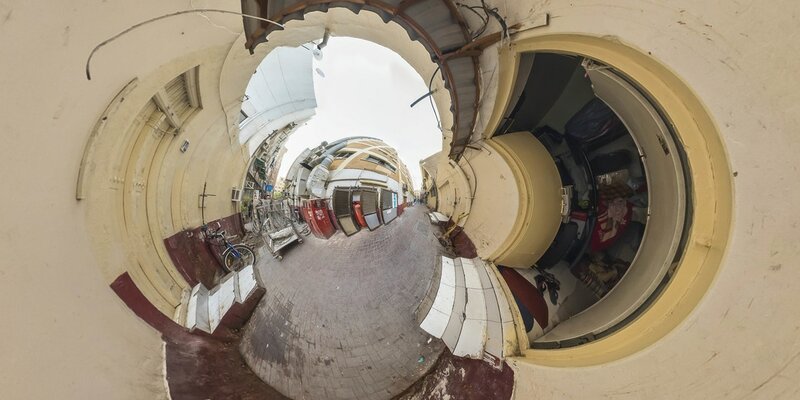 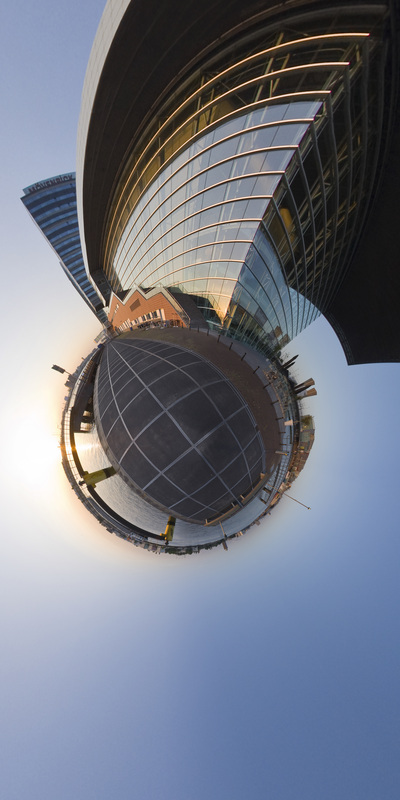 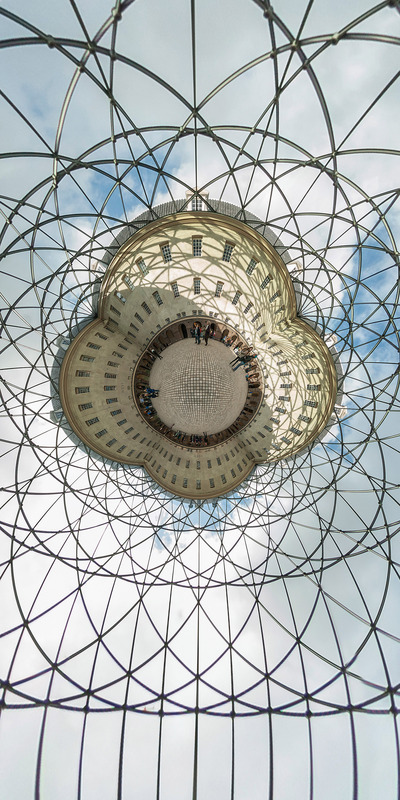 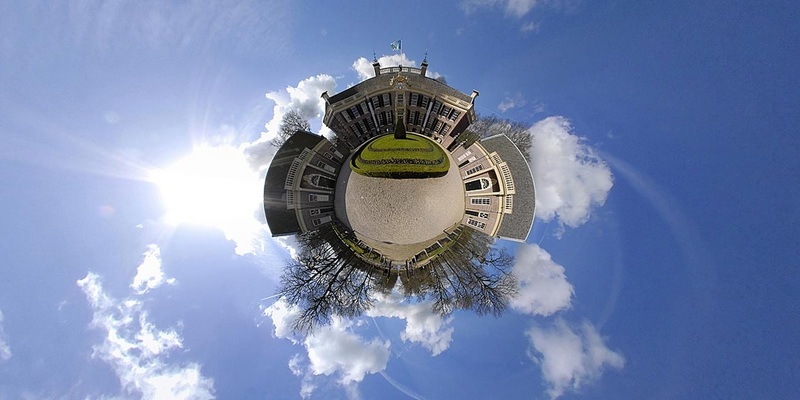 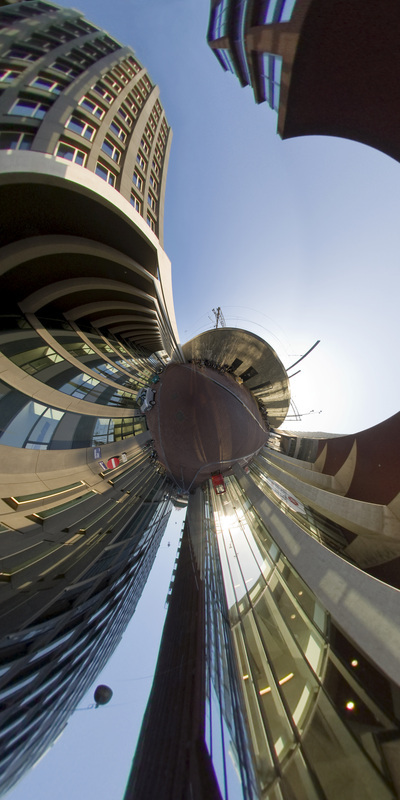 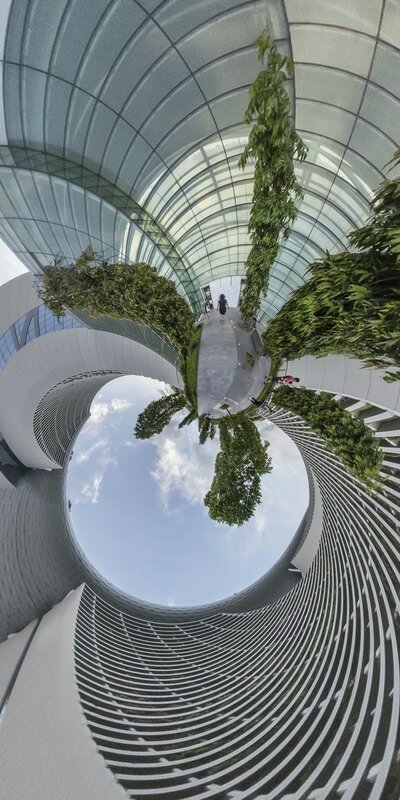 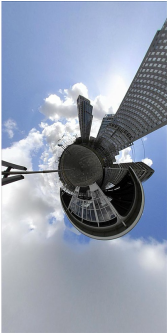 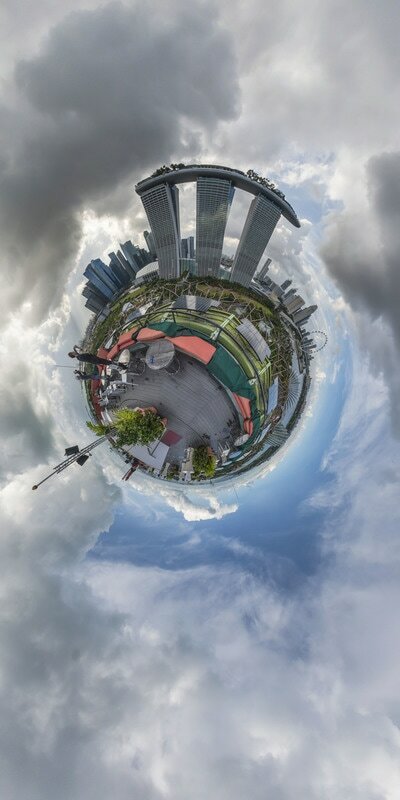 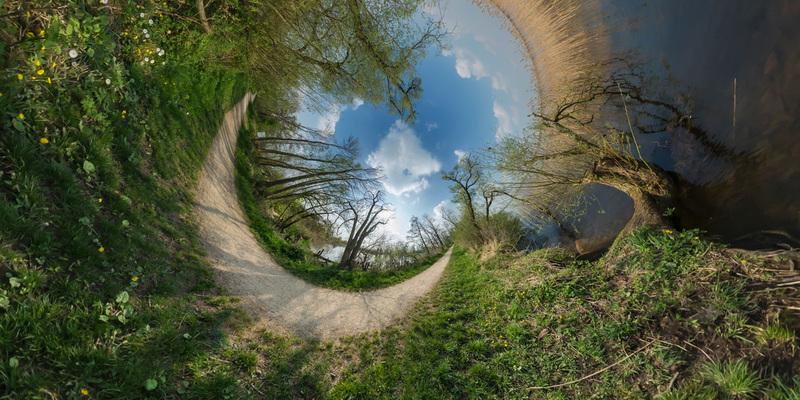 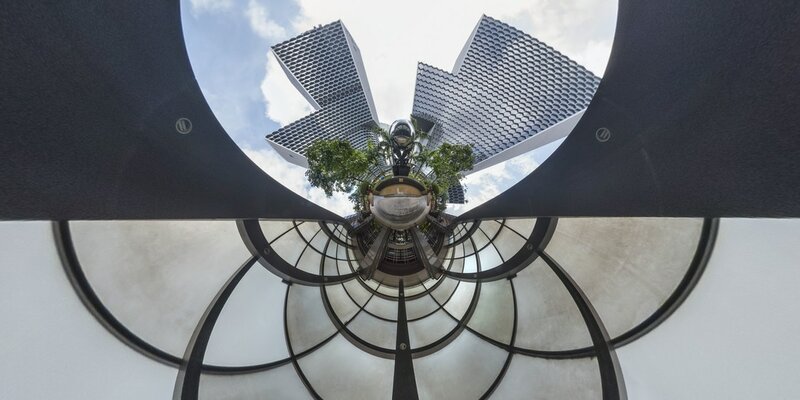 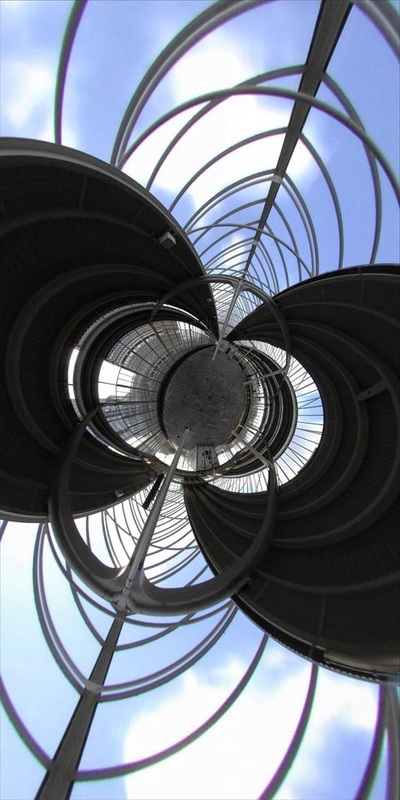 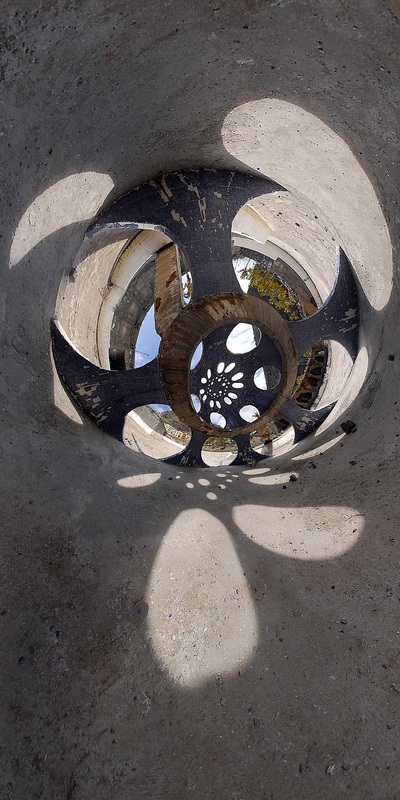 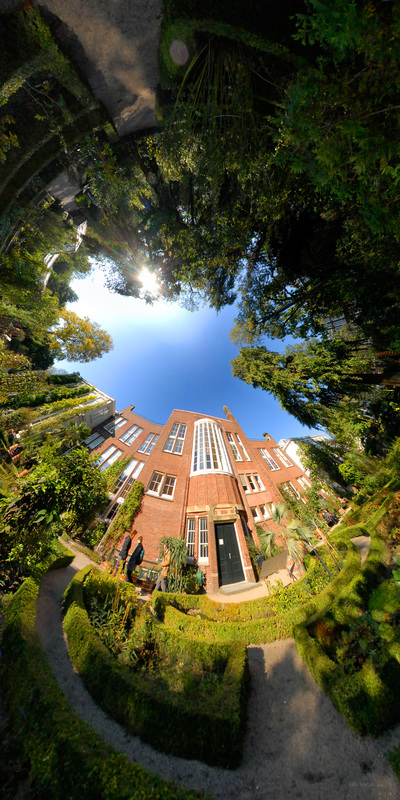 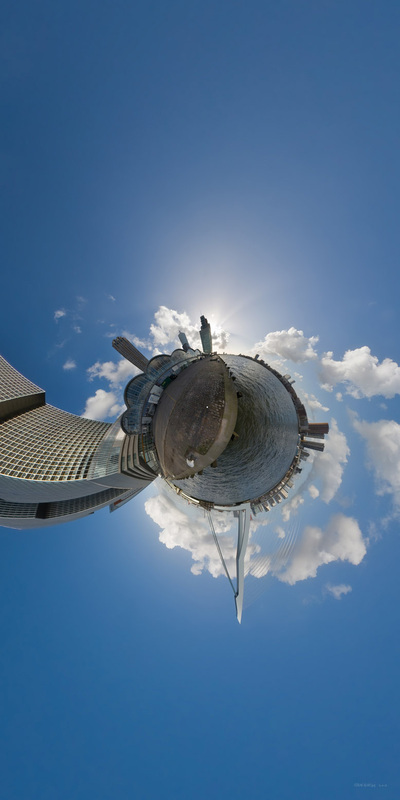 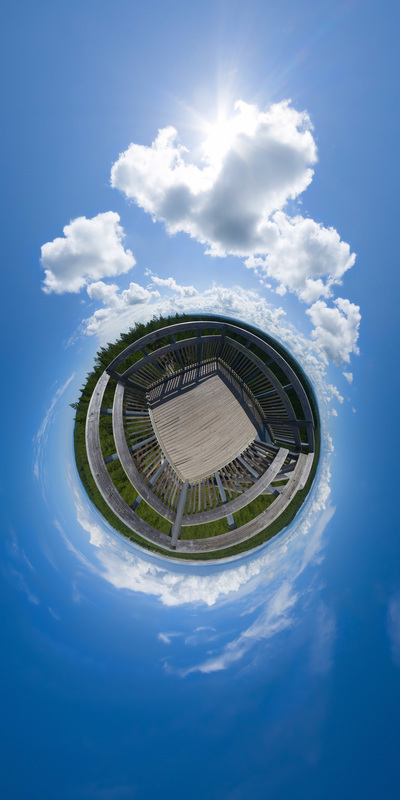 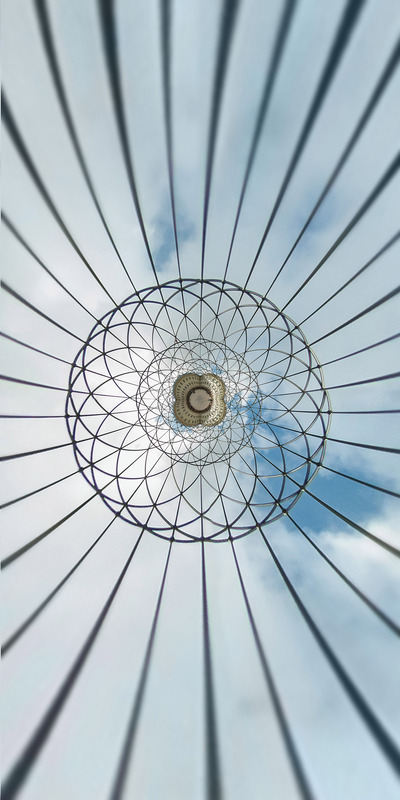 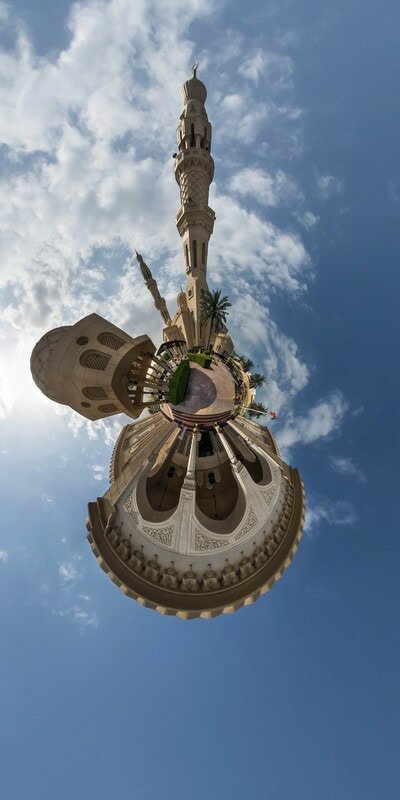 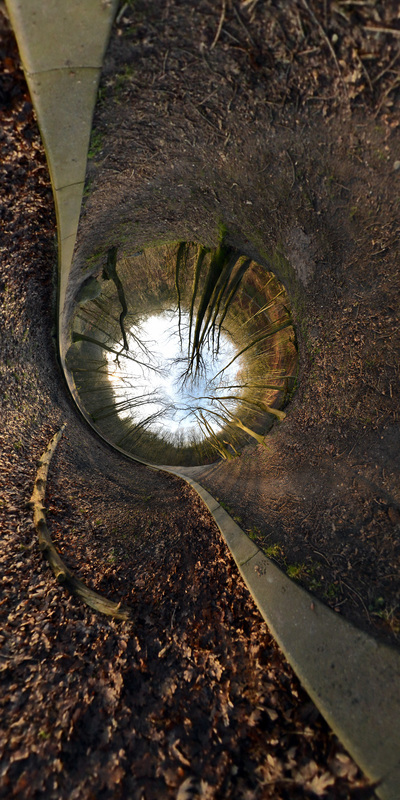 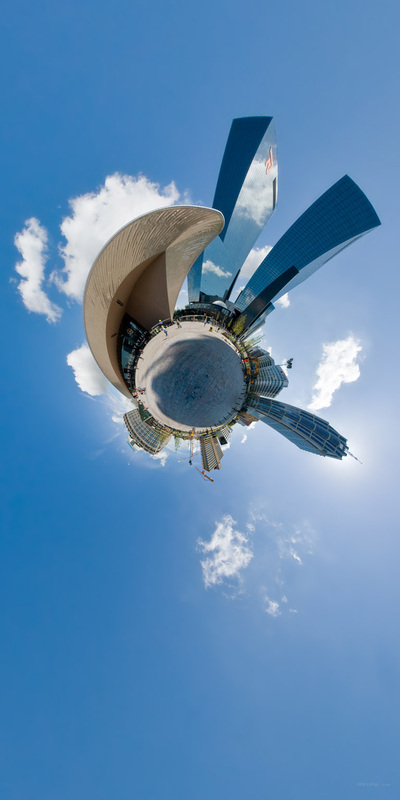 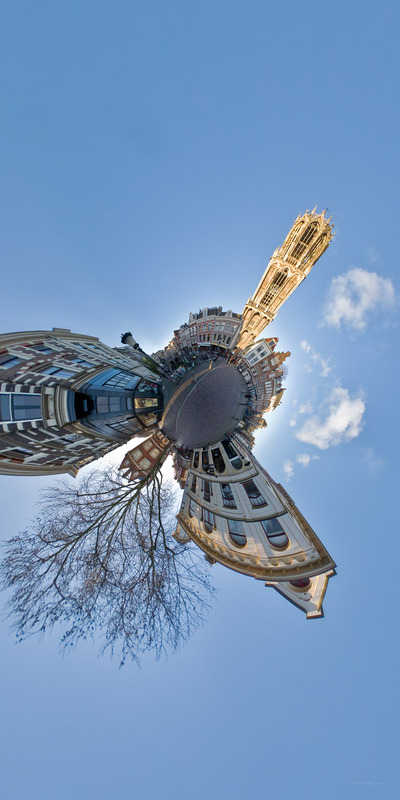 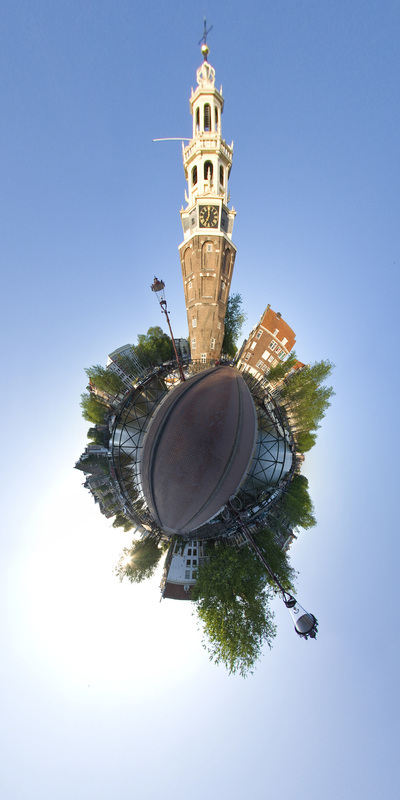 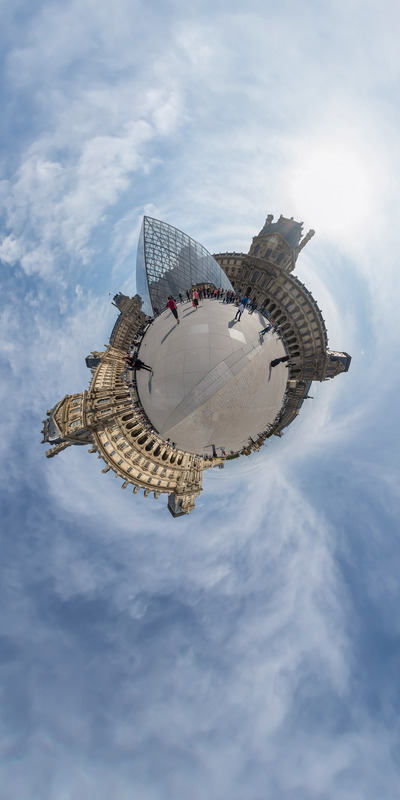 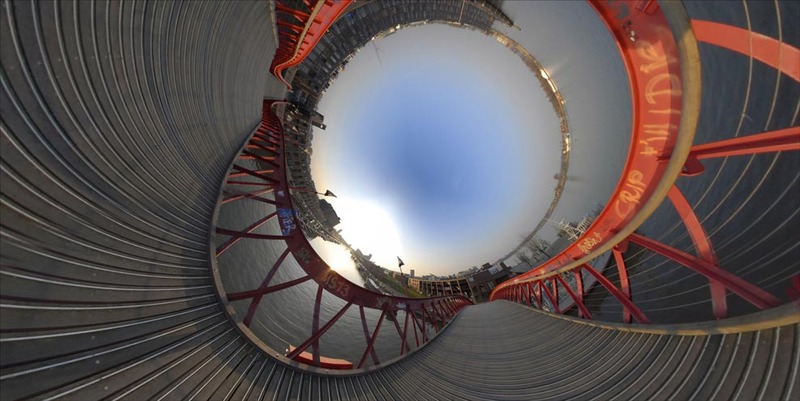 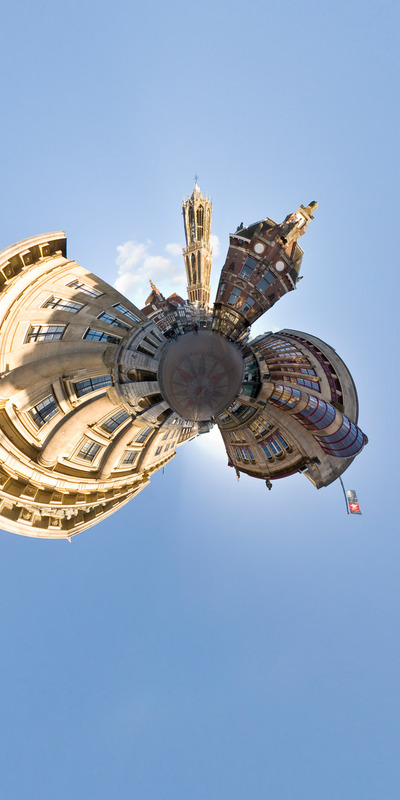 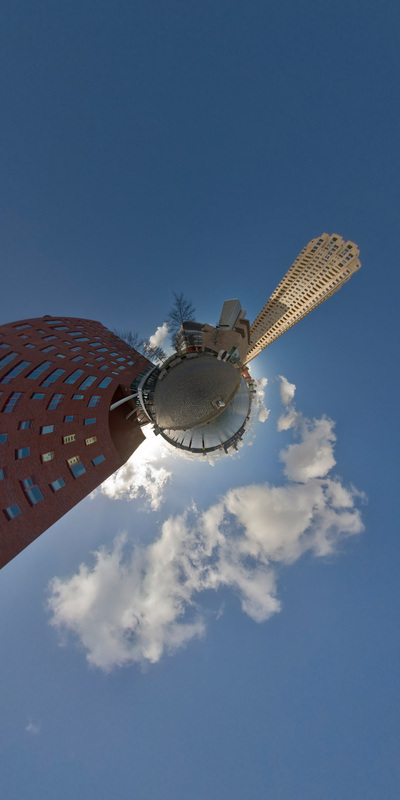 A decade ago I discovered the possibility to make such pictures photographically with four fisheye pictures, remap them to equirectangulars, stitch them to a 360° panorama and finally remap the panorama into a hyperbolic projection. 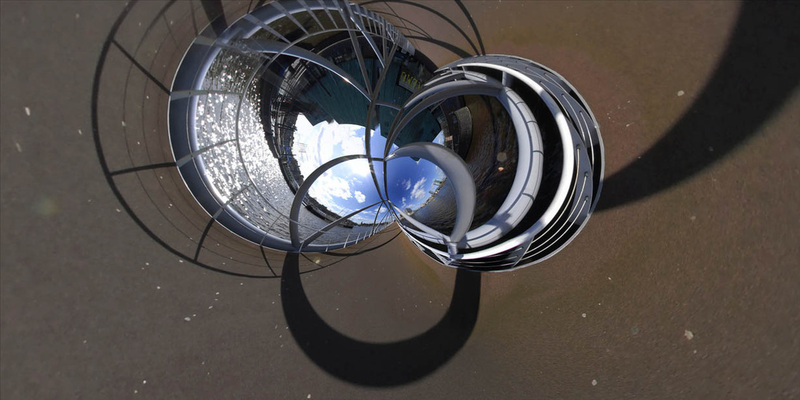 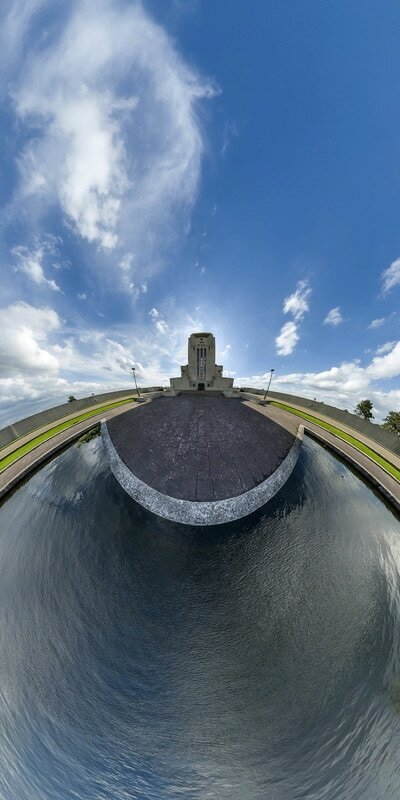 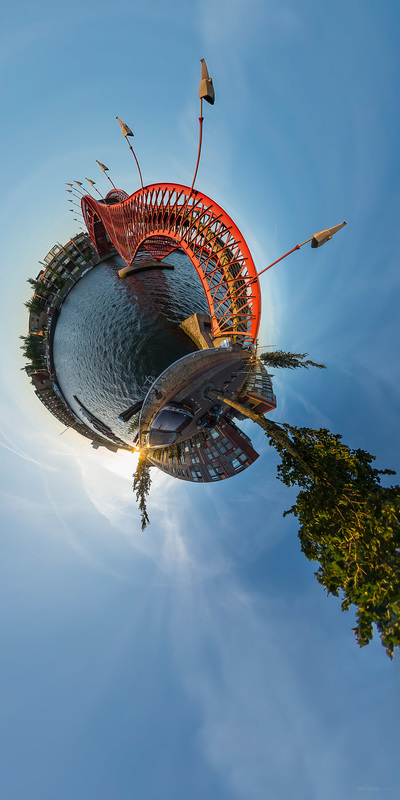 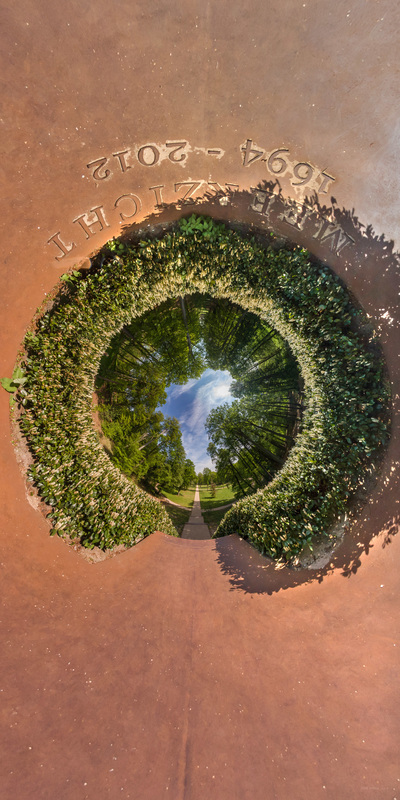 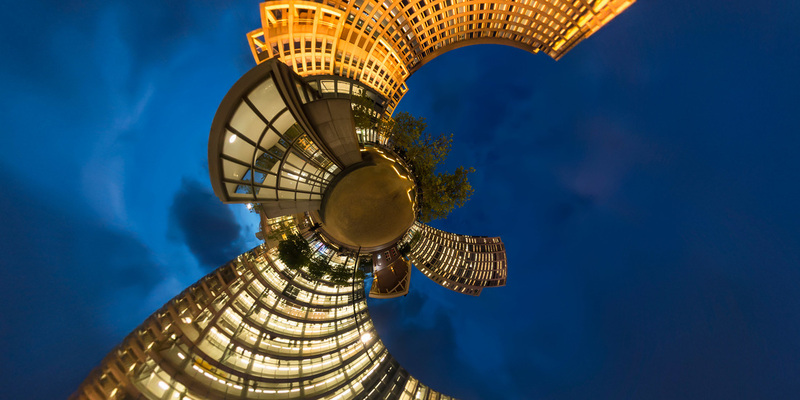 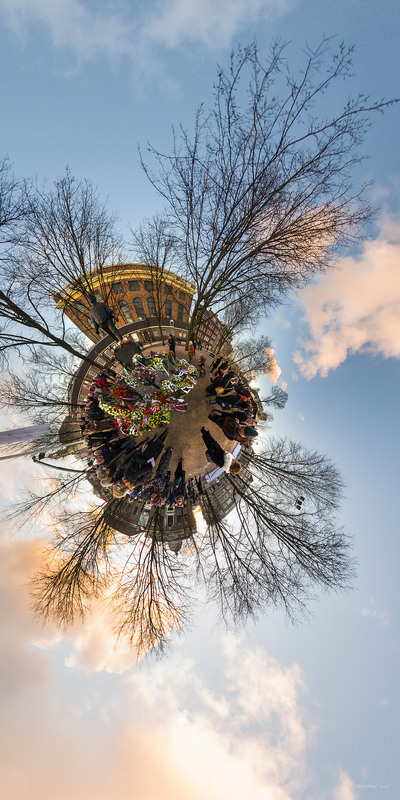 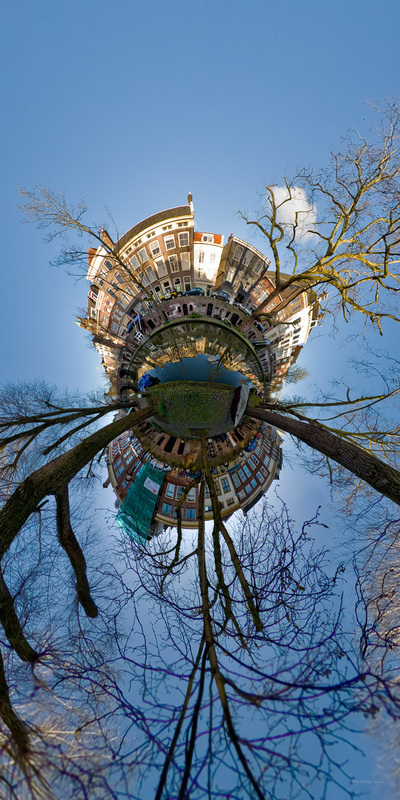 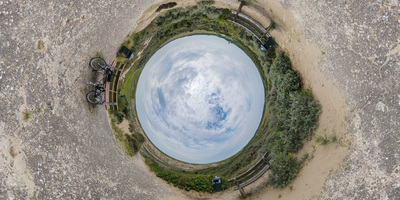 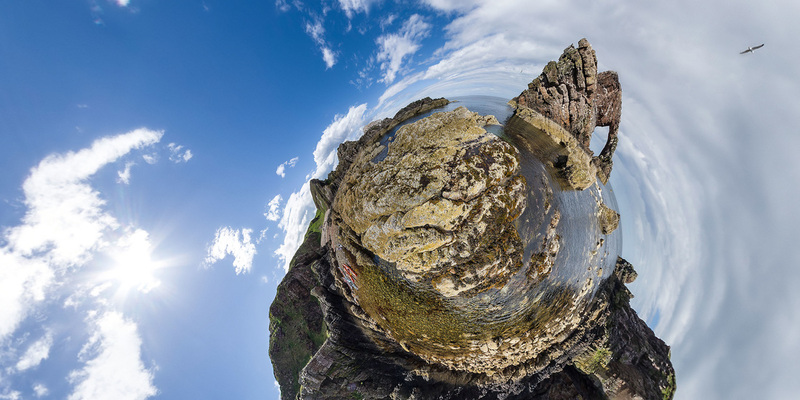 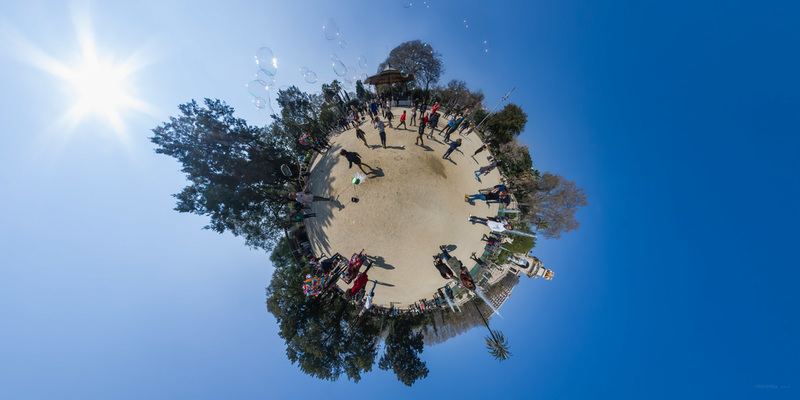 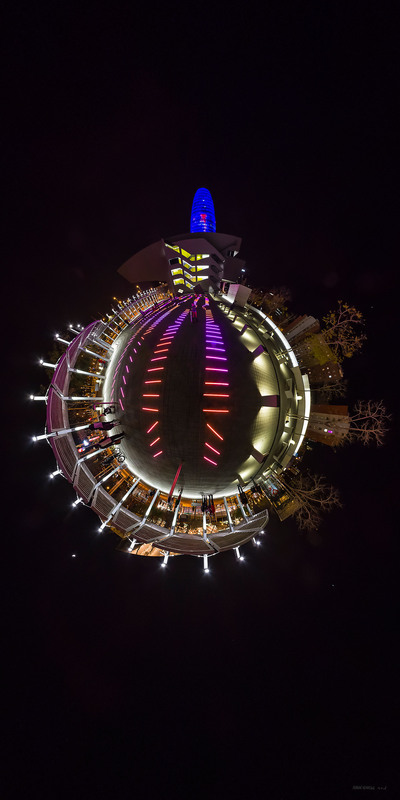 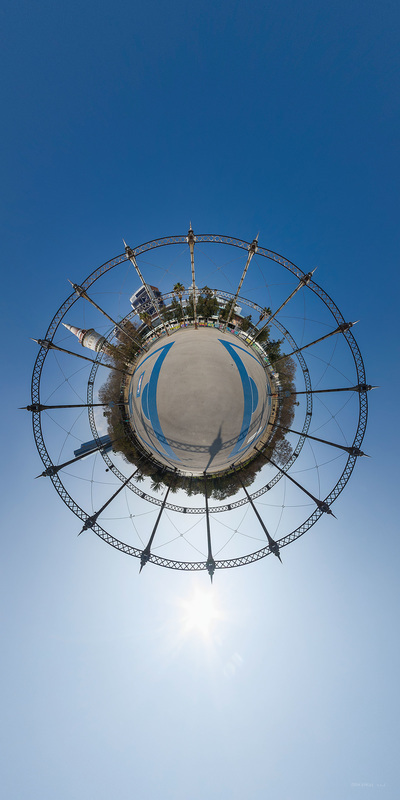 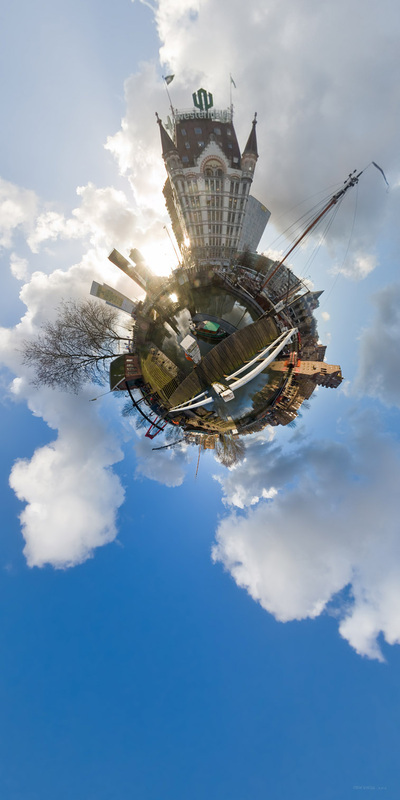 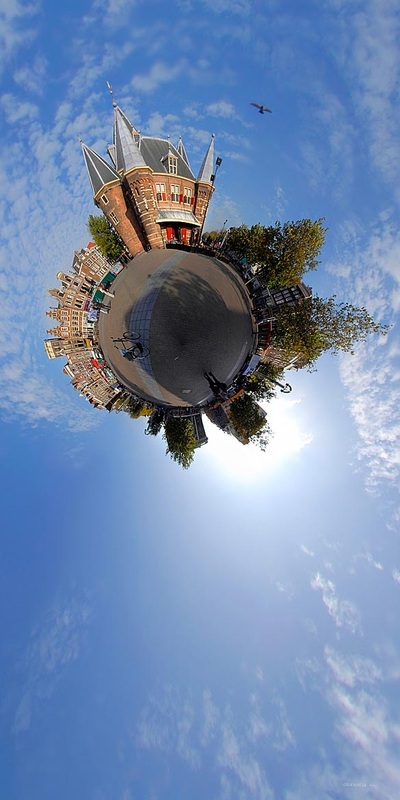 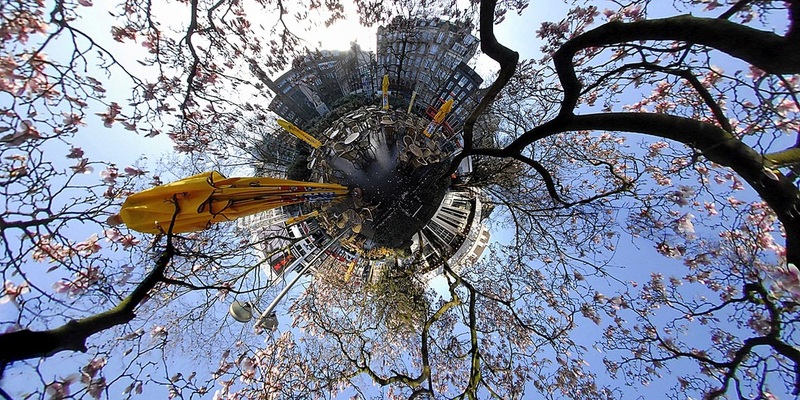 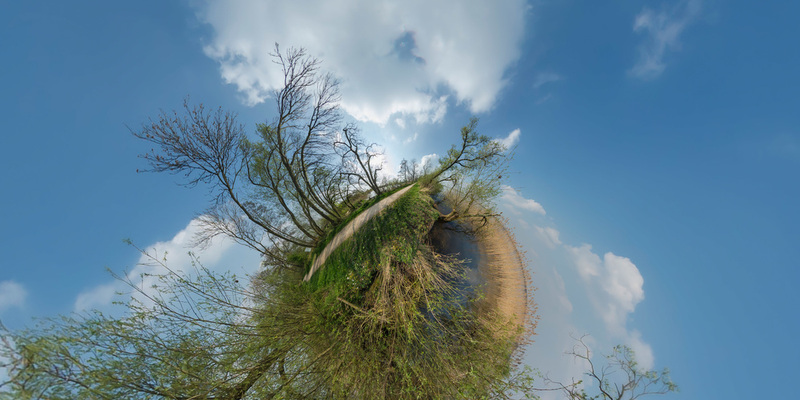 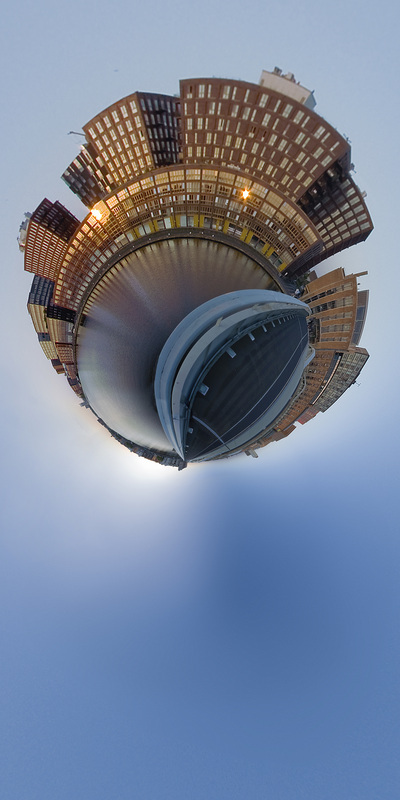 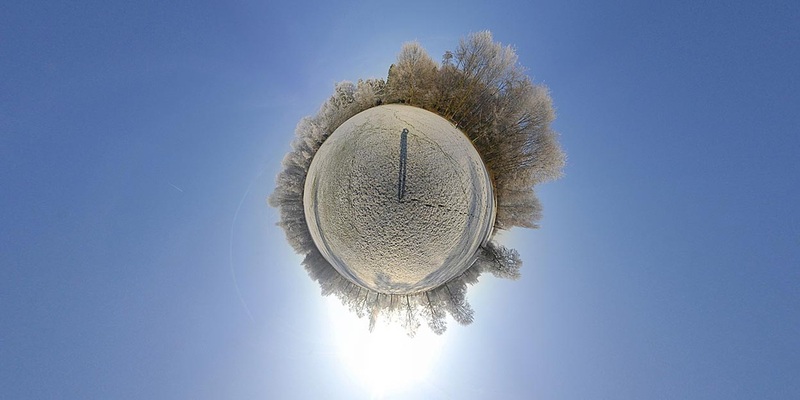 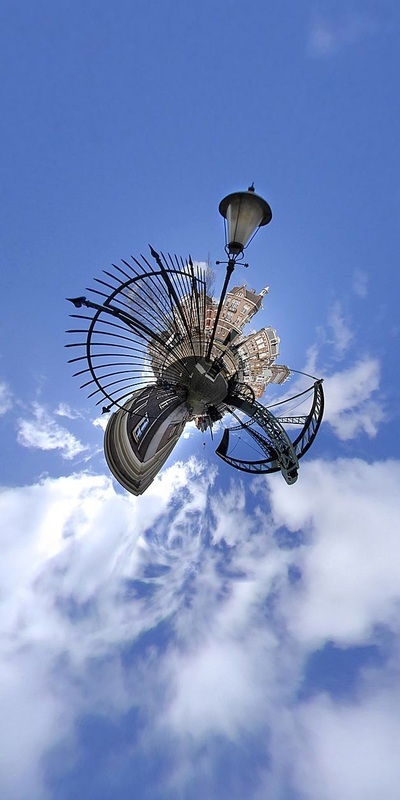 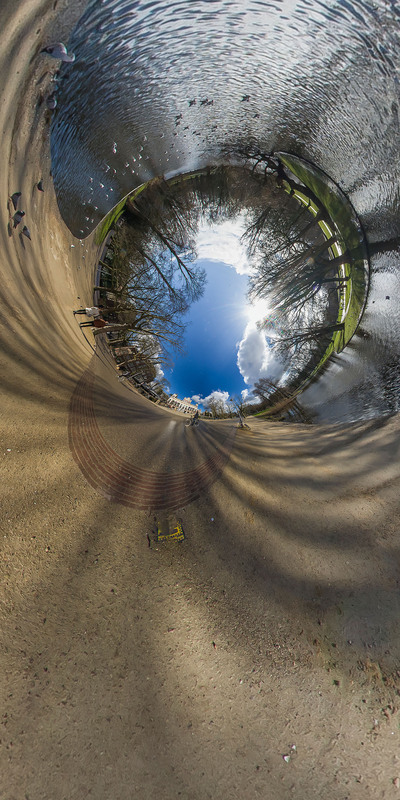 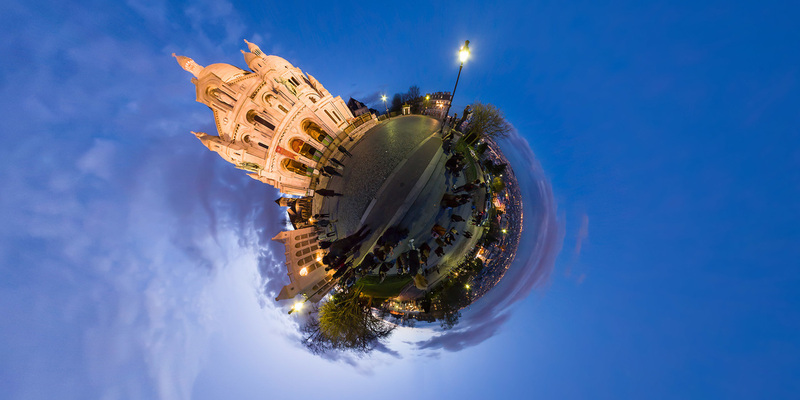 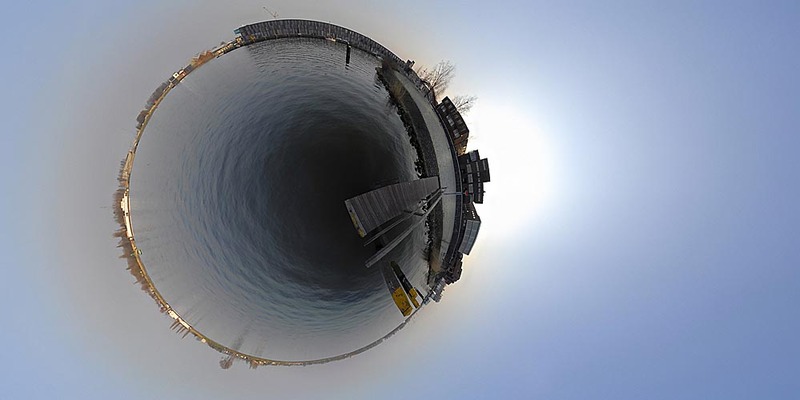 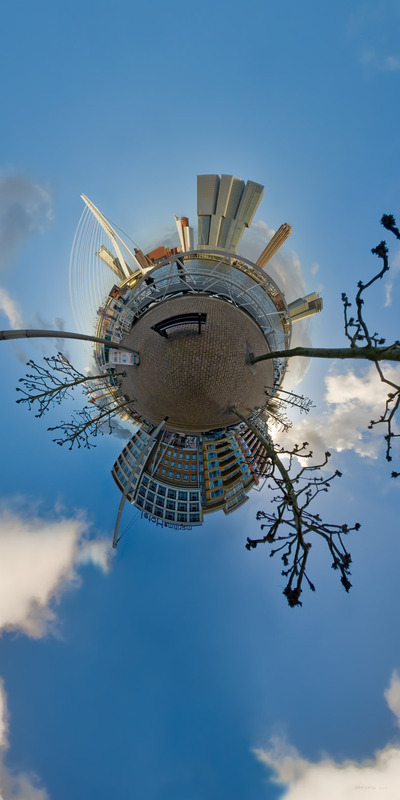 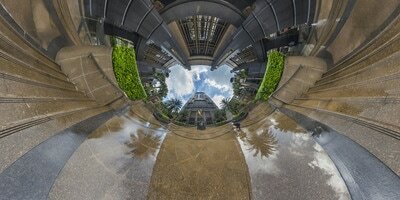 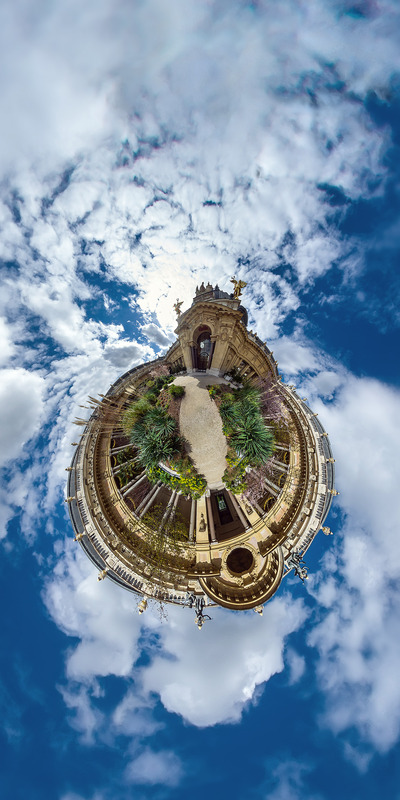 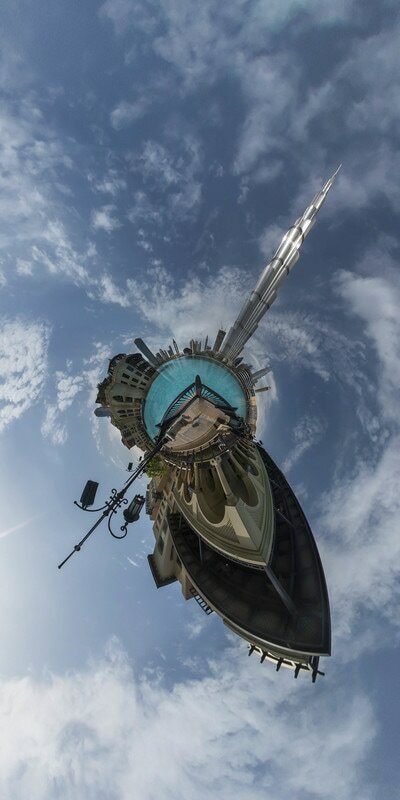 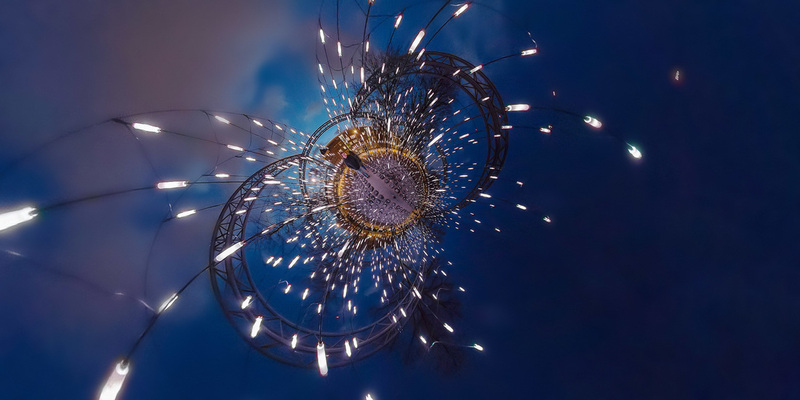 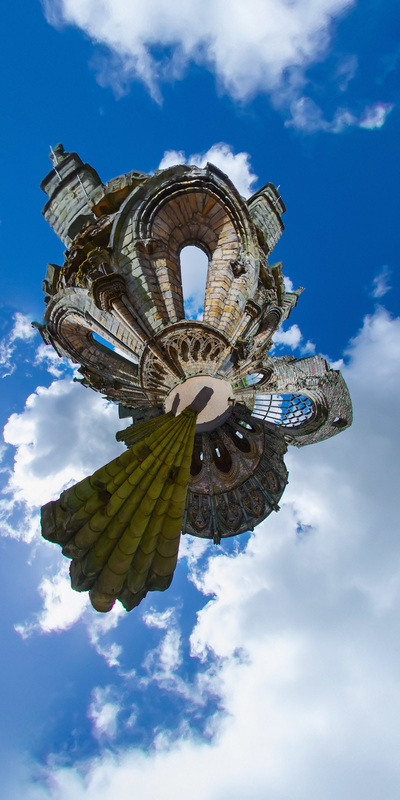 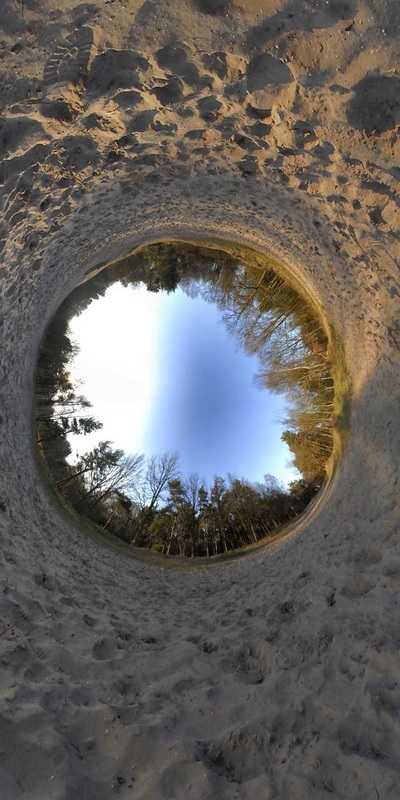 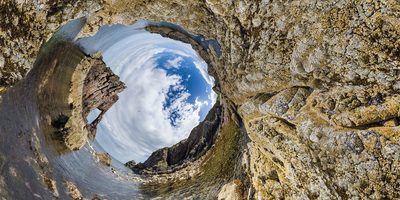 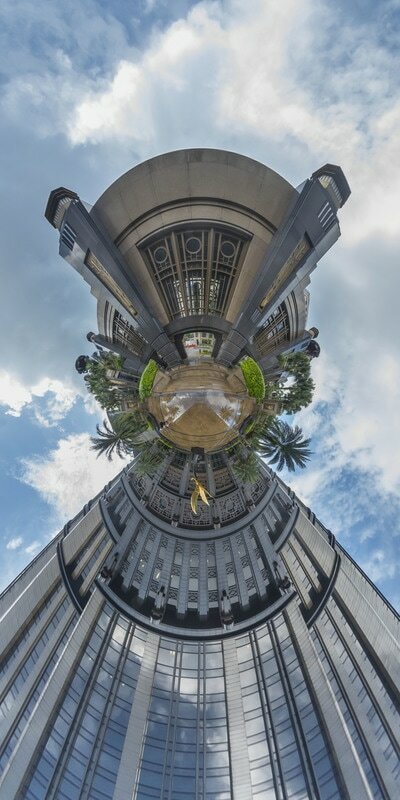 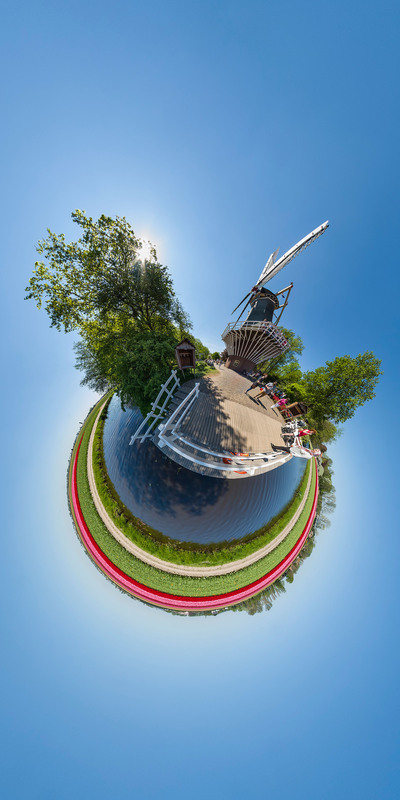 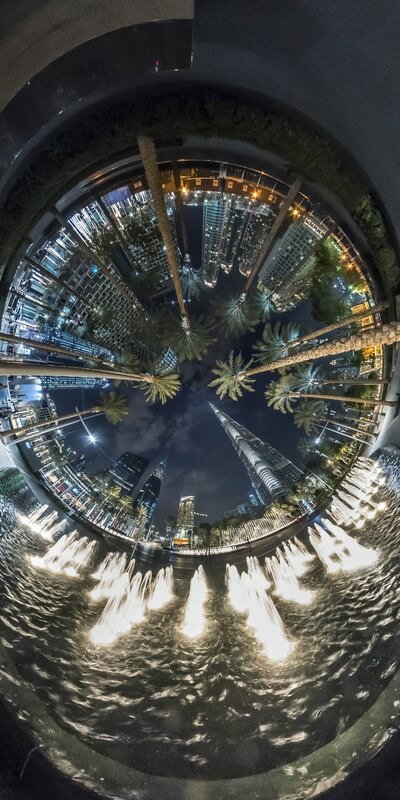 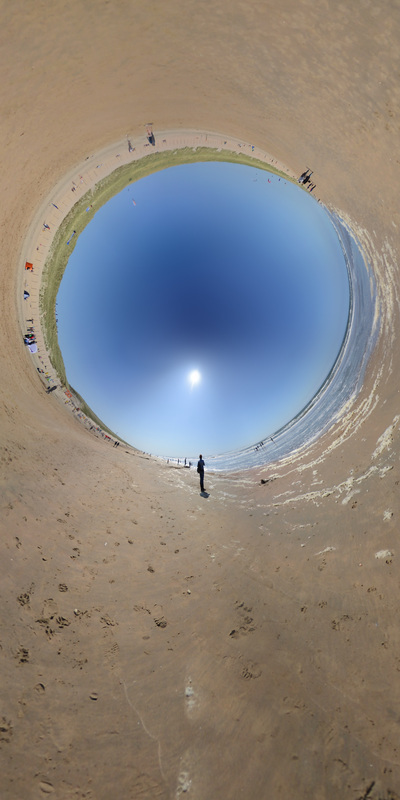 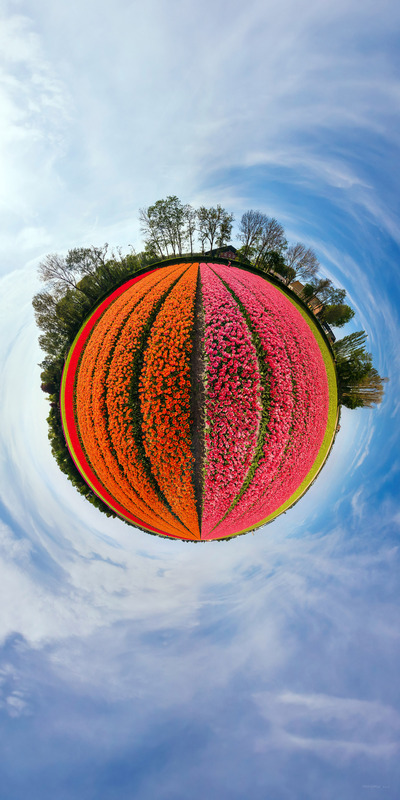 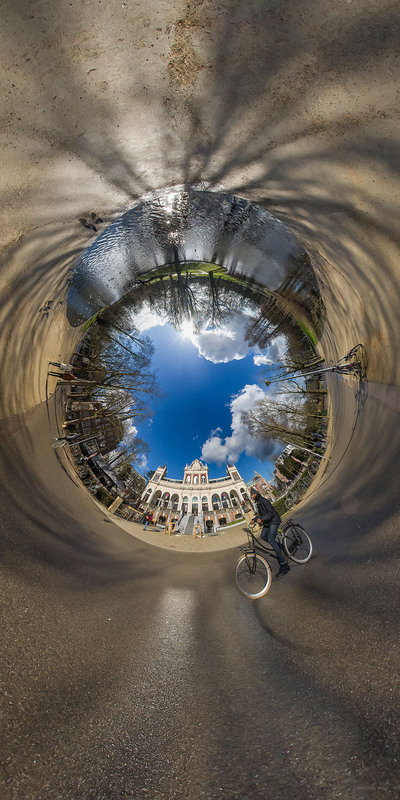 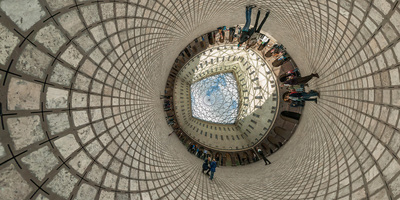 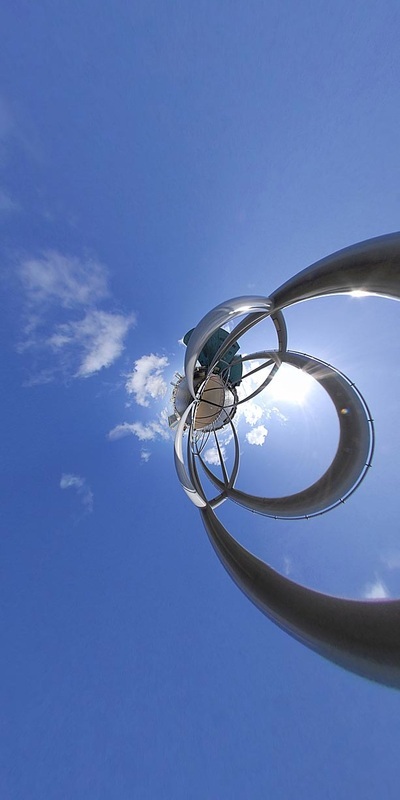 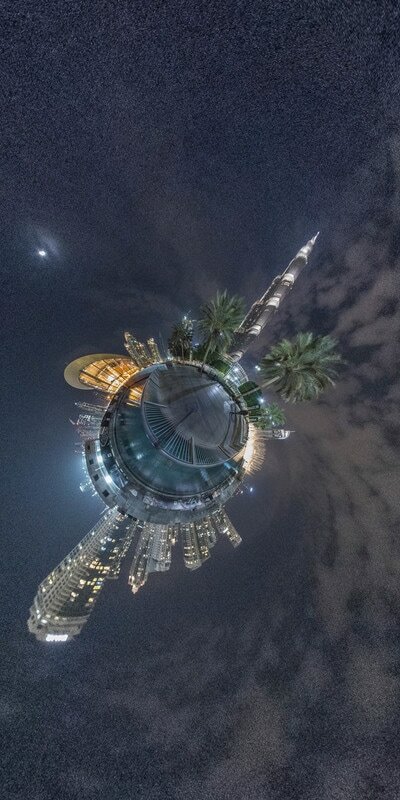 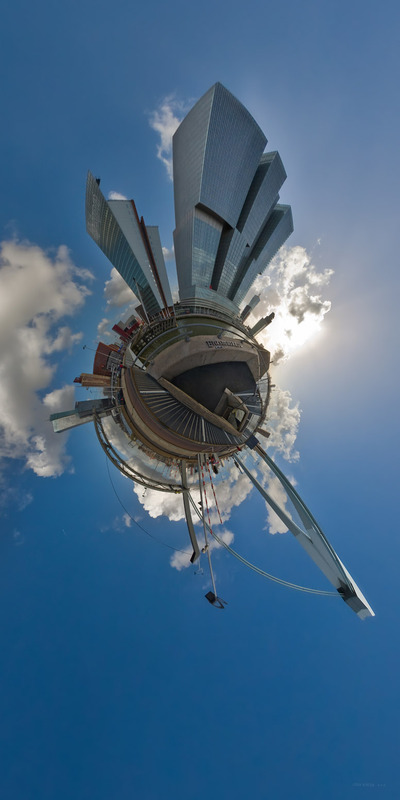 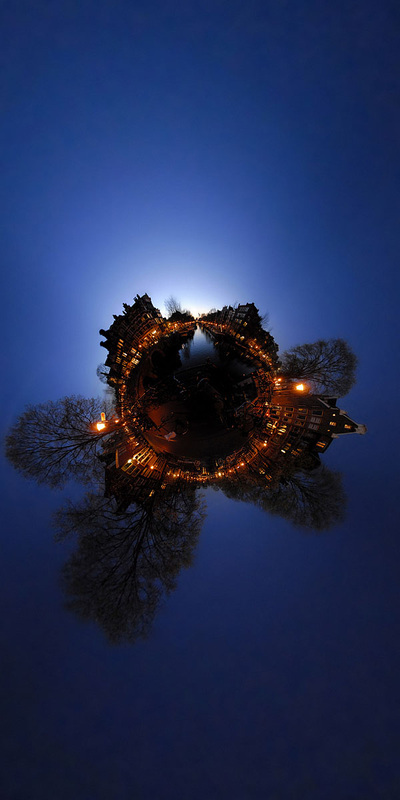 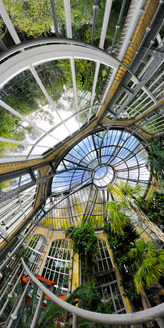 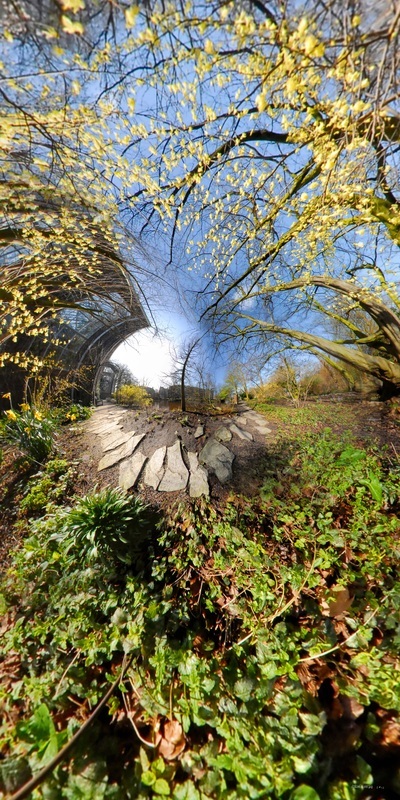 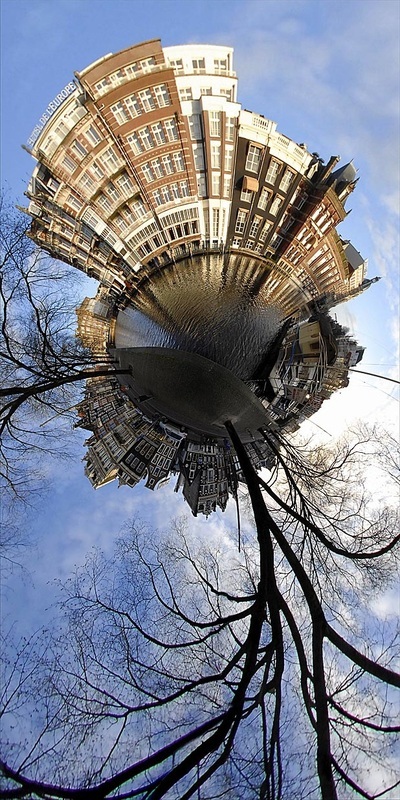 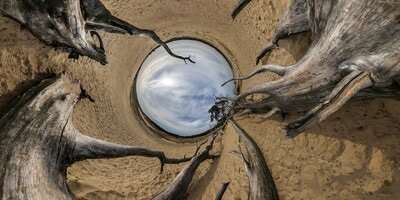 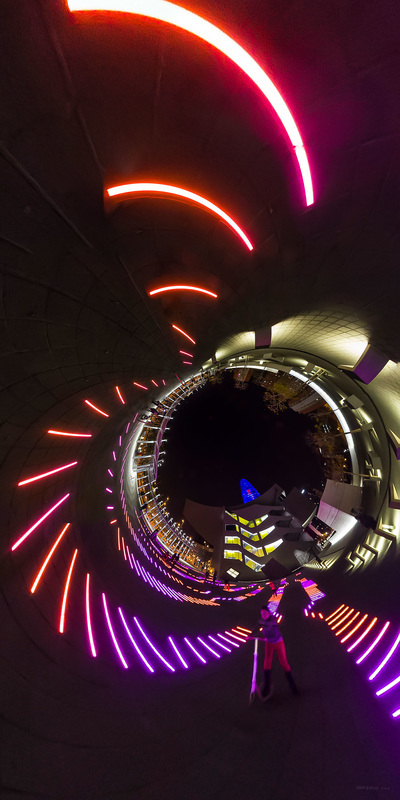 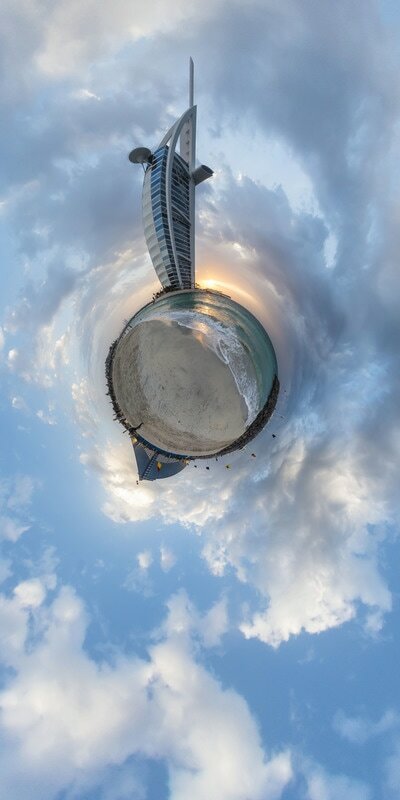 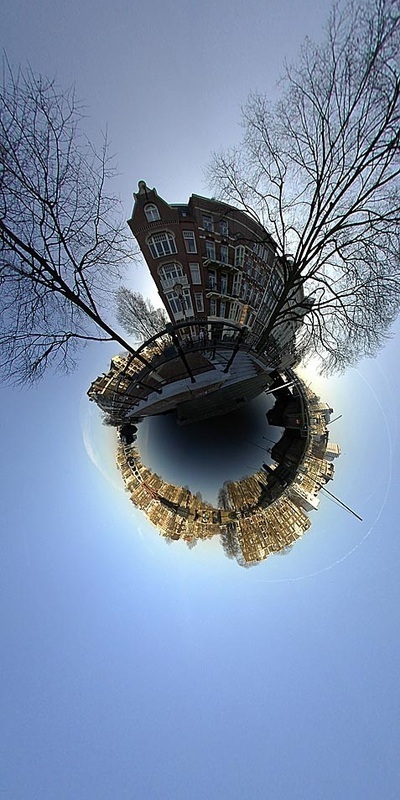 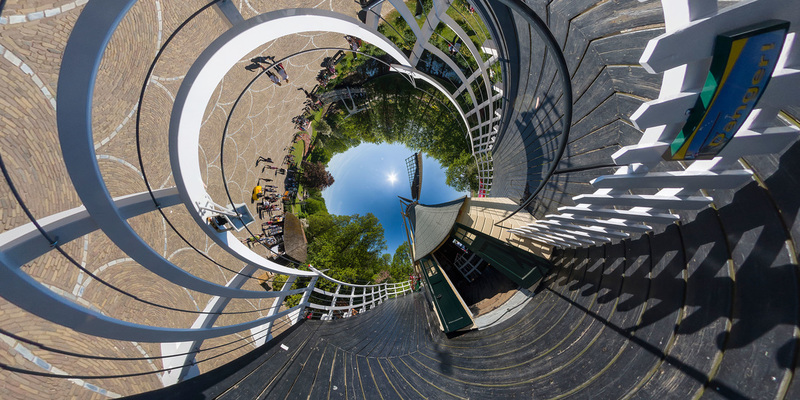 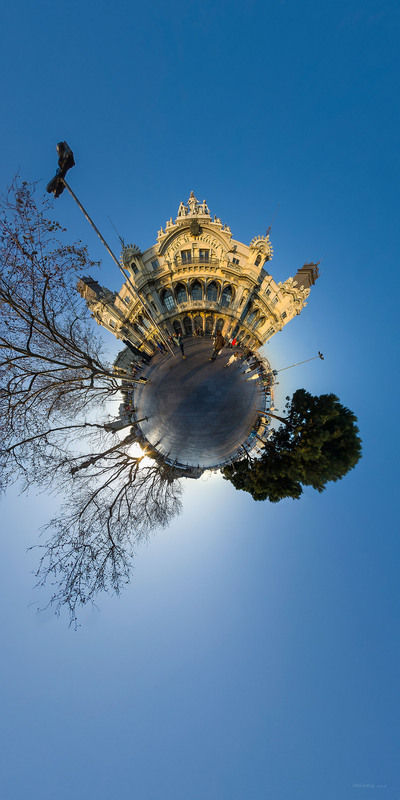 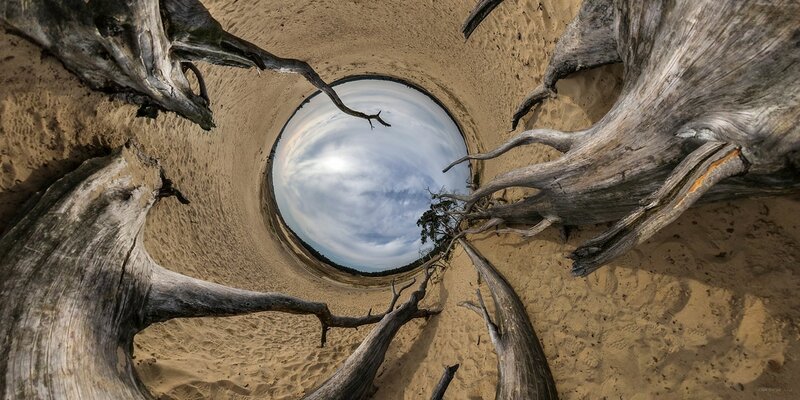 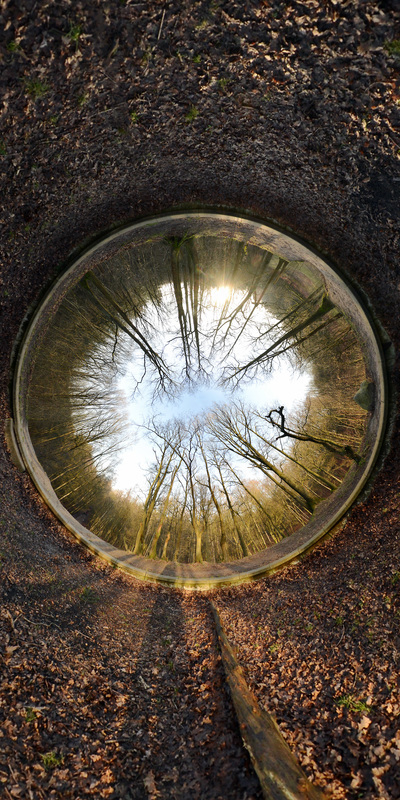 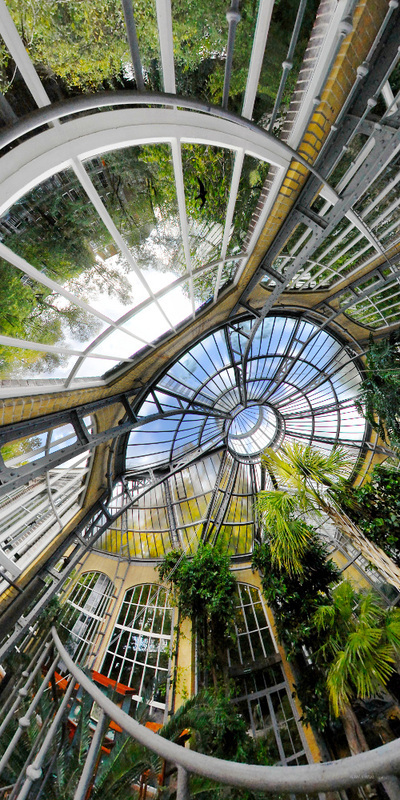 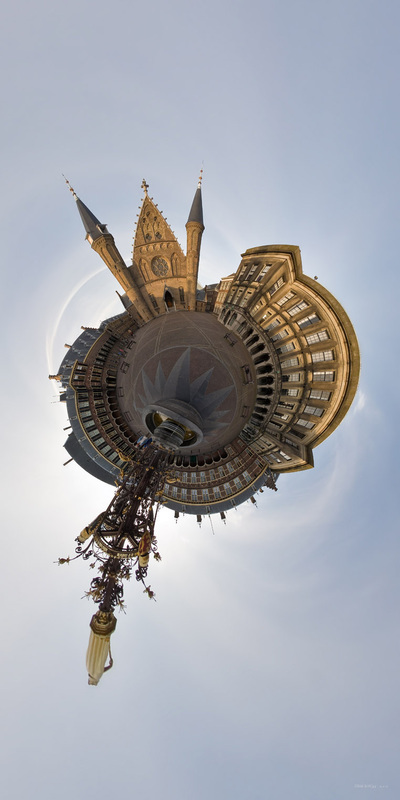 I try to pick striking subjects and manipulates these 'little planets' panoramas into perceptions on wonderful worlds. 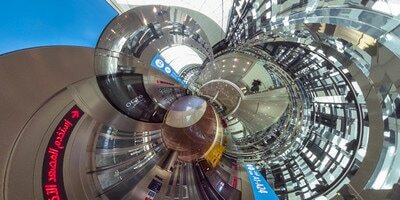 Limited edition hyperbolics are for sale in museum quality alu-dibond-acrylic glass at 50 X 100 cm. 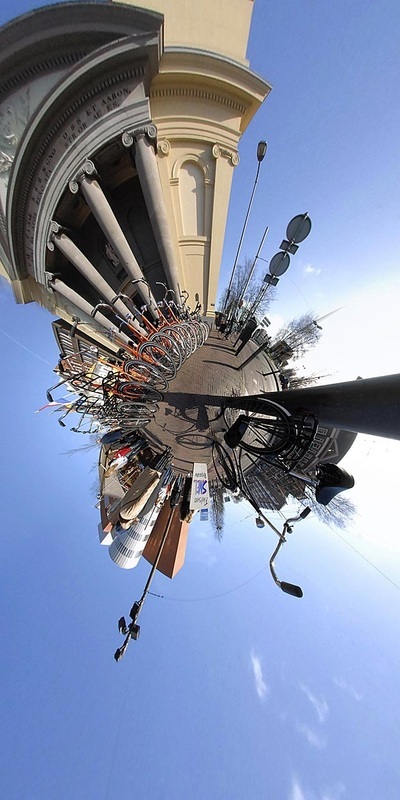 Different sizes and versions are possible after consultation. 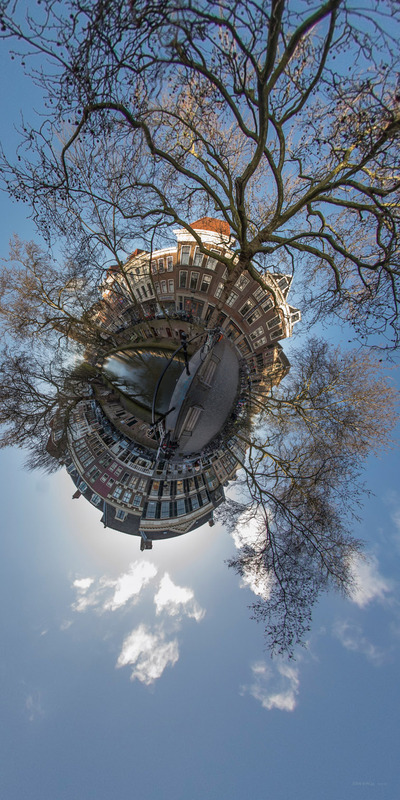 Some 100 works are rented out quite successfully by Business Art Service who also ordered a collection of the cities of Amsterdam, Den Haag, Rotterdam and Utrecht resulting in an assignment for 16 works. ​Recently I finished an assignment for building developer Trebbe to make works of their architecture throughout the Netherlands in 3 meter wide hyperbolic panorama's. 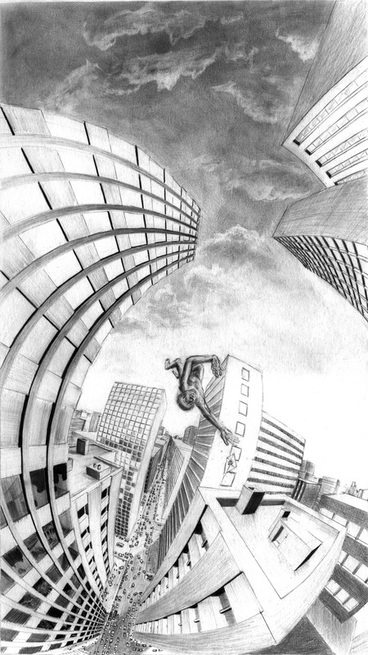 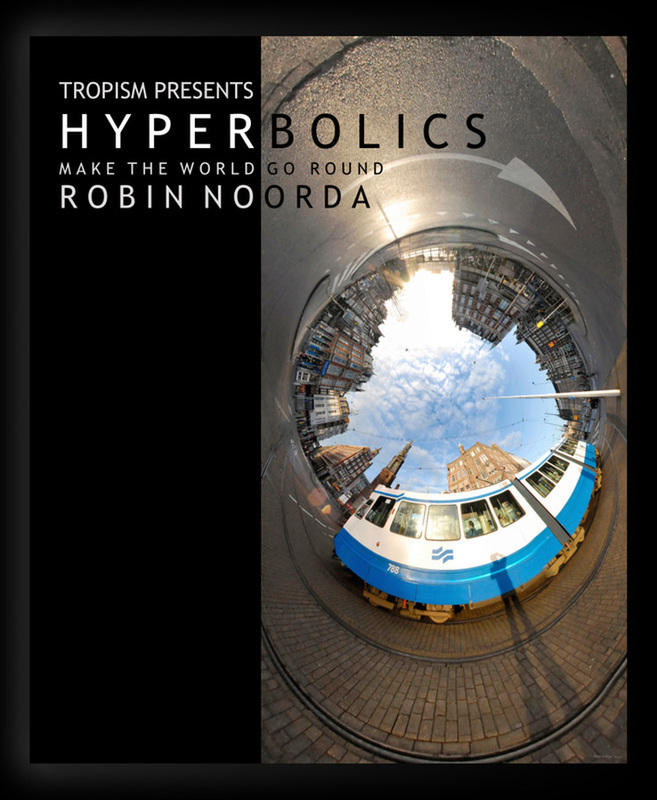 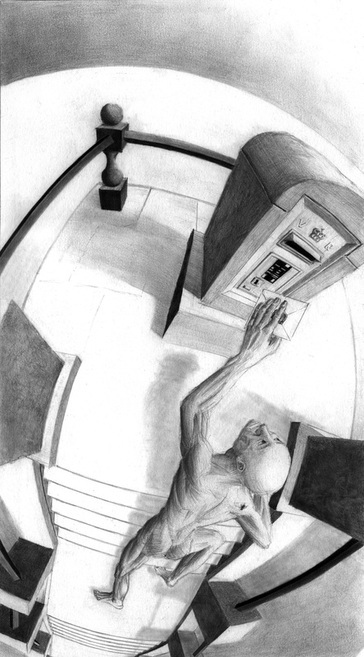 ​You can browse and order the book 'Hyperbolics make the world go round' here. 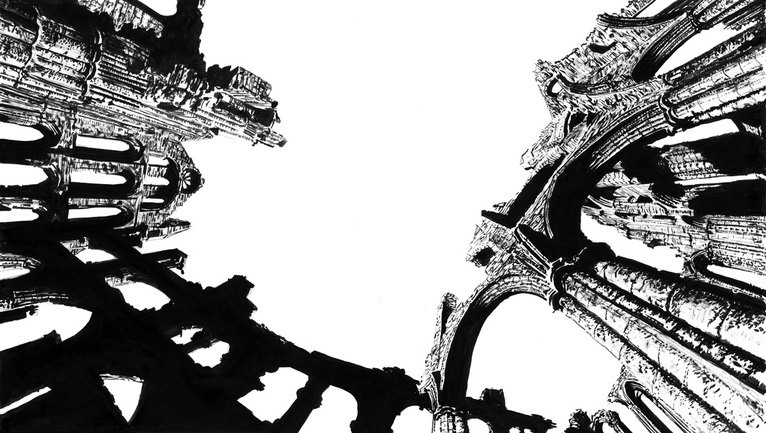 Some of the hyperbolic drawings I made in the seventies that survived.